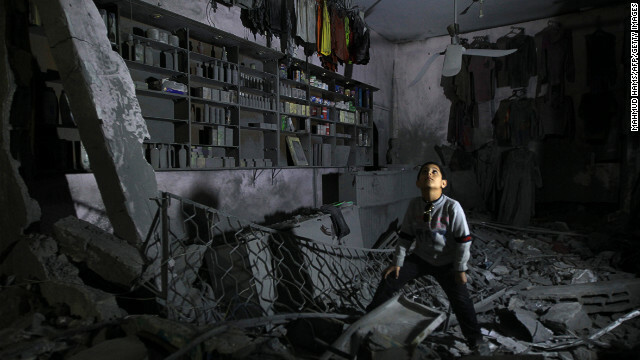 A boy stands in the rubble of a destroyed shop in Beit Lahia, in northern Gaza, on Monday, November 26. 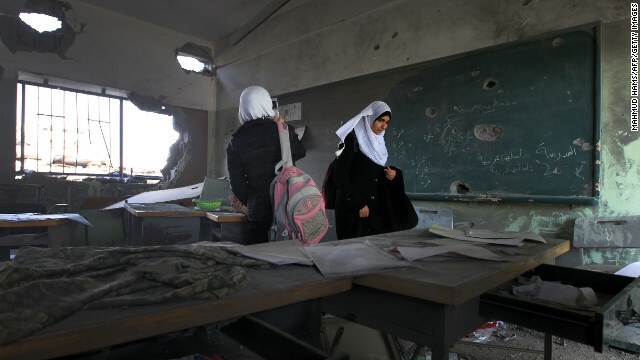 Palestinian school girls walk in a destroyed class room on Monday, November 26, in Gaza. 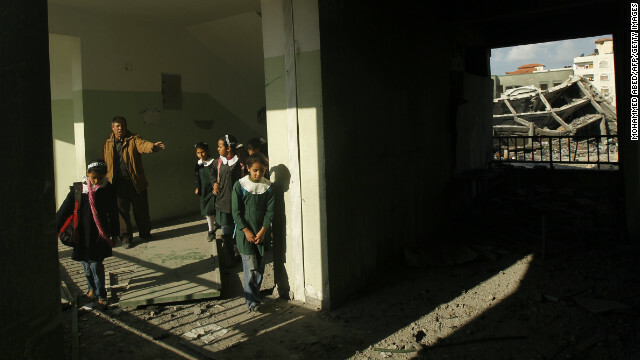 The school was damaged some days ago, before a truce between Hamas and Israel. 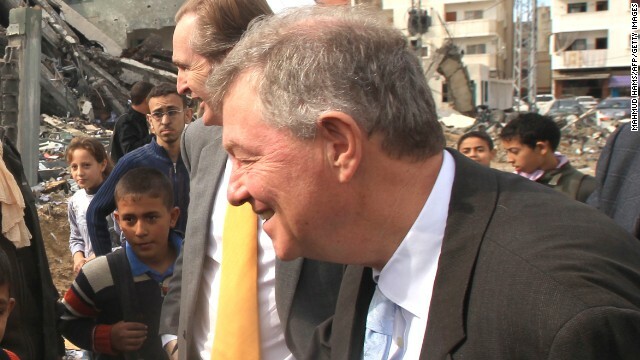 Robert Serry, the United Nations Special Coordinator for the Middle East Peace Process, greets children during a visit to Gaza to survey damage caused by the exchange of fire between Israel and Hamas militants, on Sunday, November 25. Employees of the Palestinian Interior Ministry pray in the rubble of the Interior Ministry building in Gaza City on Sunday, November 25. An Israeli soldier fires during clashes with Palestinians after Israeli settlers fought with villagers in the northern West Bank village of Qusra on Saturday, November 24. 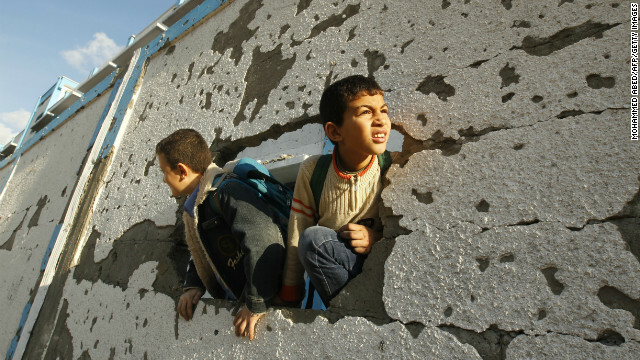 Palestinian schoolboys look through a hole at their damaged school in Gaza City on Saturday. Palestinians school girls walks along a corridor of their school in Gaza City on Saturday. 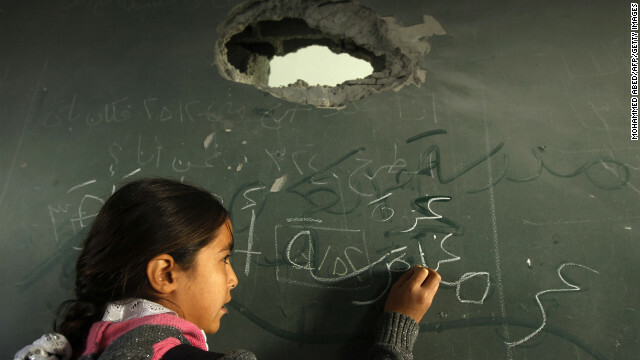 A Palestinian schoolgirl writes on the blackboard of a classroom in Gaza City on Saturday. 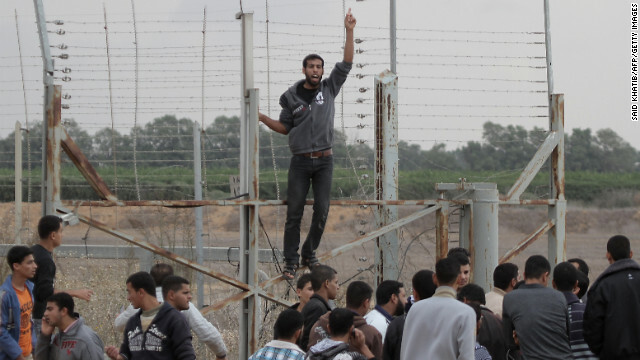 Palestinian youths gesture during a demonstration next to the security fence on the Gaza border with Israel east of Khan Yunis, in the southern Gaza Strip, on Friday, November 23. A Palestinian was shot dead by Israeli forces near the Gaza border, the first casualty since the two sides agreed a truce ending their week-long conflict, Palestinian medical sources said. 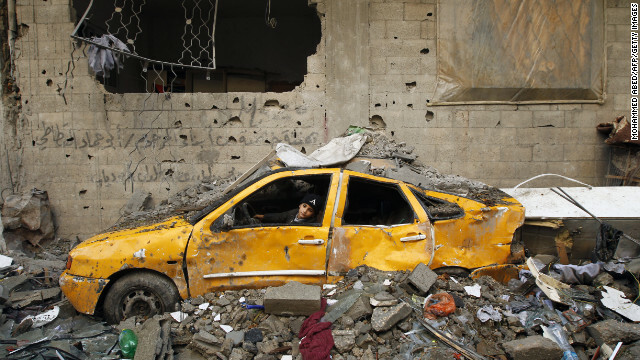 A Palestinian boy plays in a demolished car in Gaza City on Friday. 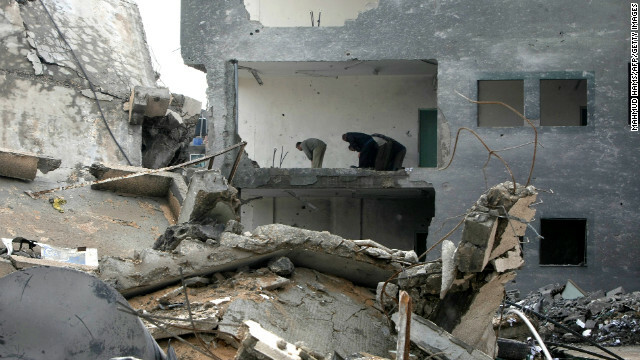 Palestinians inspect the rubble of a destroyed house in Gaza City on Friday. Palestinians gather to listen to Hamas Prime Minister Ismail Haniyeh speak Thursday in Gaza City. 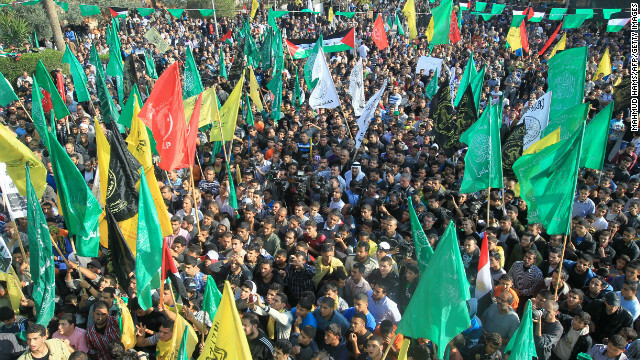 Supporters of Hamas and its moderate rival Palestinian party Fatah displayed rare unity in celebrating the cease-fire. Hasidic Jewish boys dance near the border with northern Gaza on Thursday. The Jews provided music on a visit to show their support for the Israeli soldiers. 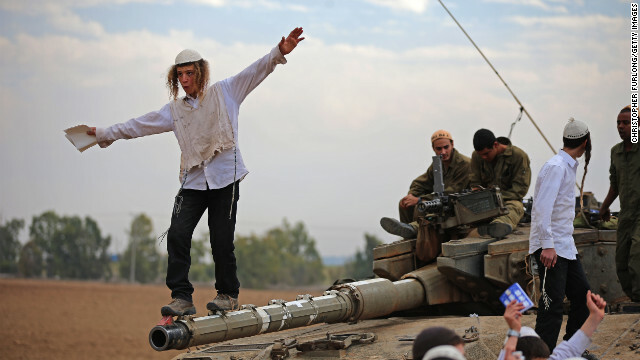 A Hasidic Jewish boy dances on the barrel of a tank Thursday as he and others celebrate the Israeli soldiers. 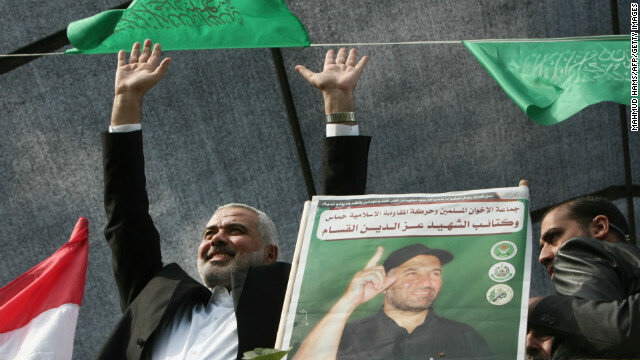 Hamas Prime Minister Ismail Haniyeh waves to the crowd Thursday in Gaza City. Haniyeh, who heads the governing party of Gaza, said the cease-fire showed the United States had been forced to soften its stance in the region in the wake of the Arab Spring. 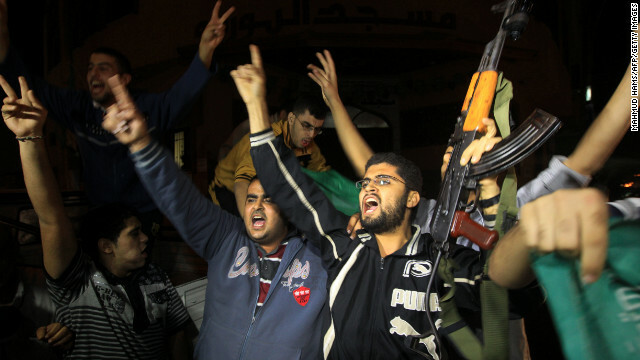 Palestinians celebrate news of the cease-fire with Israel in Gaza City on Wednesday, November 21. 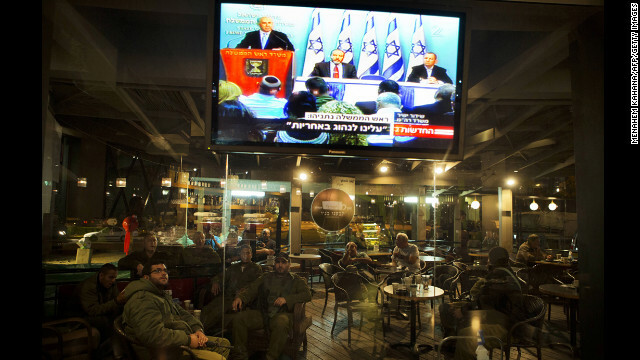 Israeli soldiers sit in a restaurant at the Yad Mordechay Junction as they watch Israeli Prime Minister Benjamin Netanyahu deliver a statement on live television from Jerusalem. 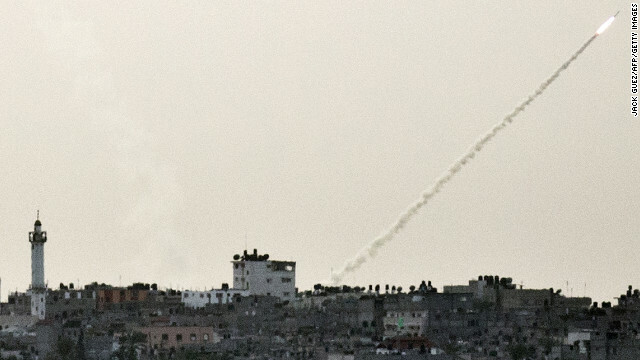 Rockets launch from Gaza City as an explosion is seen on the horizon at Israel's border with Gaza on Wednesday. 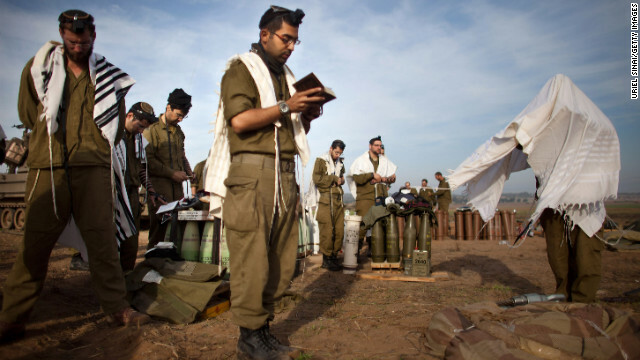 Israeli soldiers pray next to an artillery gun along Israel's border with Gaza on Wednesday, November 21. 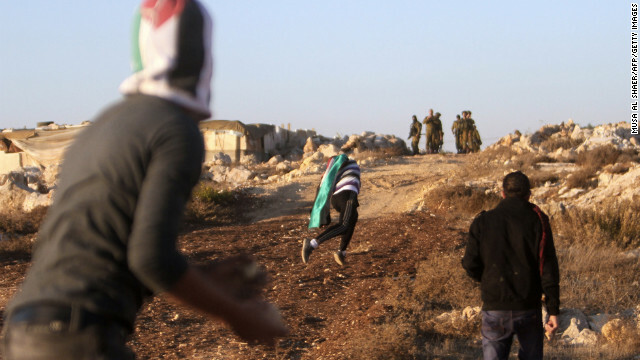 Violence continued in the region Wednesday, leaving hopes of a cease-fire in tatters just hours after a halt in fighting seemed close. 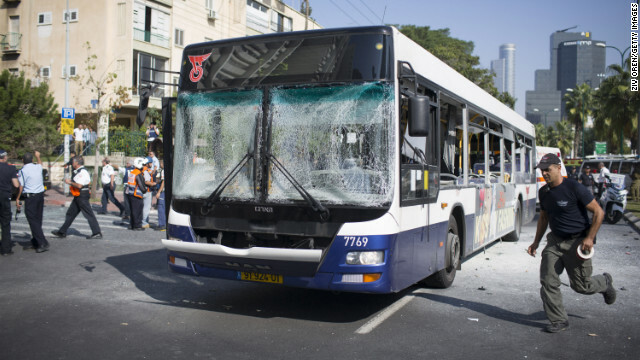 Emergency services personnel work at the scene of an explosion on a bus Wednesday in Tel Aviv, Israel. The blast on the public transport bus left at least 22 injured, a hospital official said. 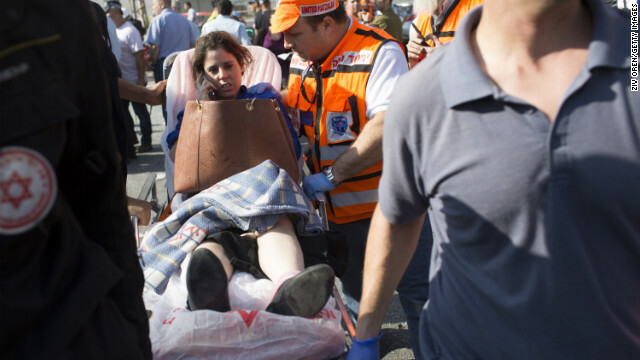 A woman is helped at the scene by emergency workers Wednesday after the explosion on the bus in Tel Aviv. 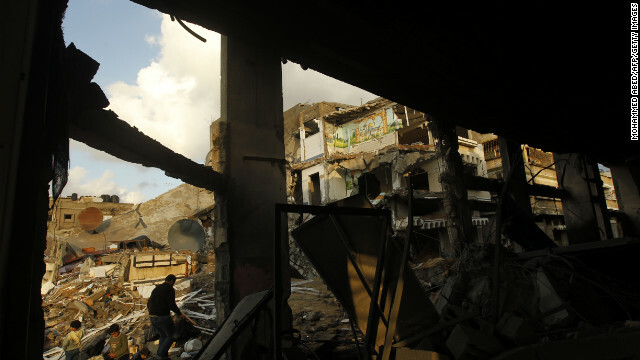 The Ministry of Internal Security compound in Gaza City is in ruins Wednesday after an Israeli airstrike targeted it overnight. 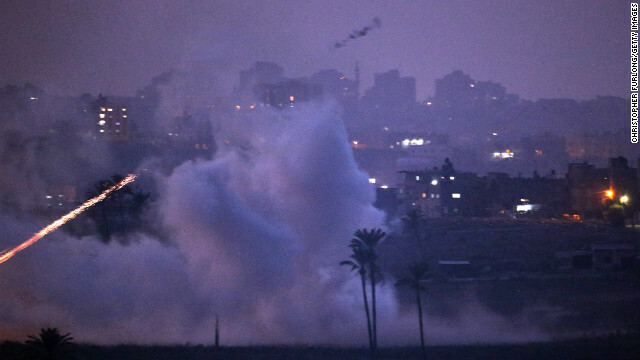 Smoke billows after Israeli airstrikes in southern Gaza on Wednesday. 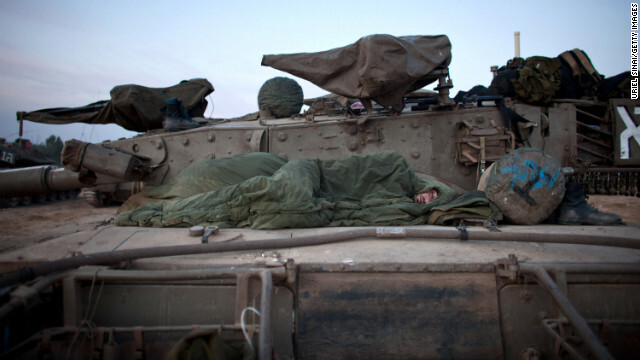 An Israeli soldier sleeps in a deployment area Wednesday on Israel's border with Gaza. 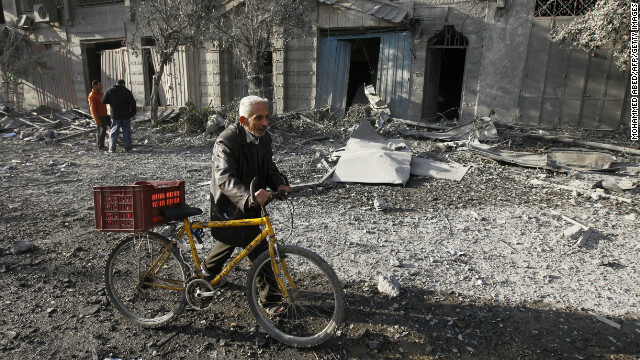 A Palestinian pushes his bicycle amid debris Wednesday near the destroyed compound of the Ministry of Internal Security in Gaza City. 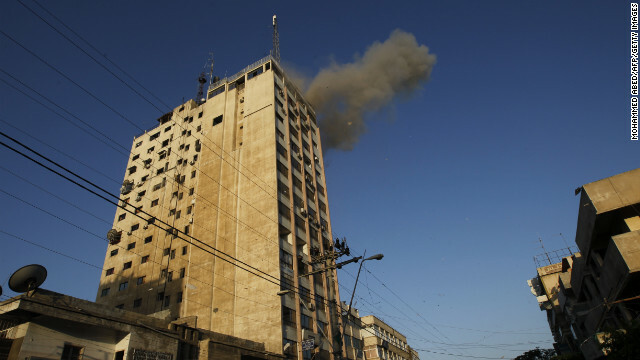 An Israeli airstrike targeted the building overnight. 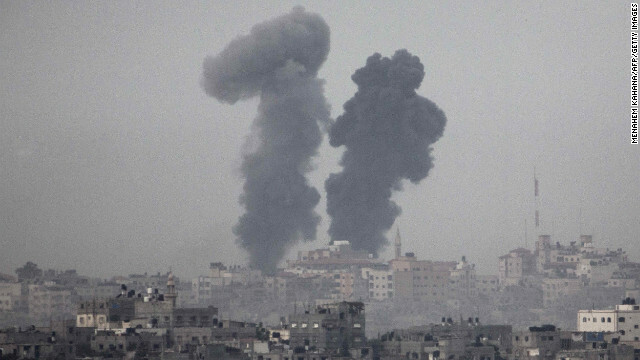 The Israeli military strikes border tunnels between Egypt and southern Gaza on Tuesday, November 20. 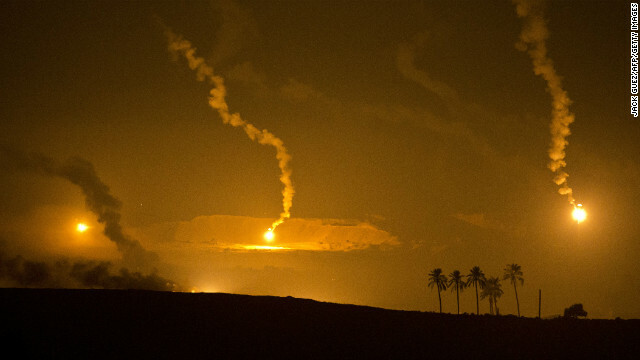 Israeli-fired artillery flares illuminate the sky over the southern Israeli border with Gaza Tuesday as fighting continues. 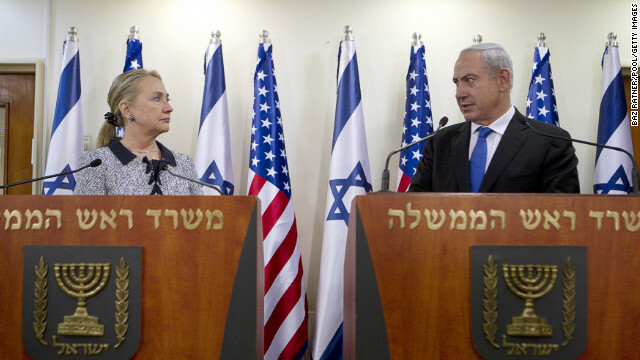 Israeli Prime Minister Benjamin Netanyahu and U.S. Secretary of State Hillary Clinton met to deliver joint statements in Jerusalem, Tuesday. 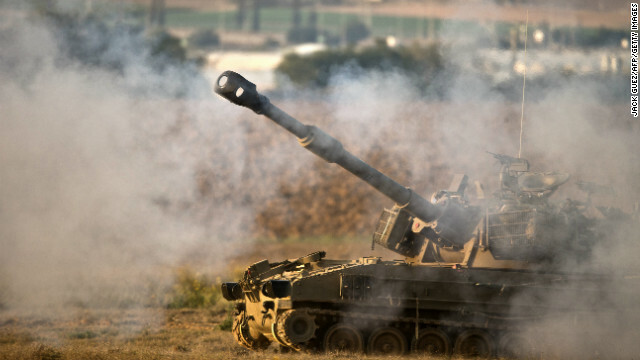 Israeli forces fire a shell from the Israel-Gaza border into Gaza on Tuesday. 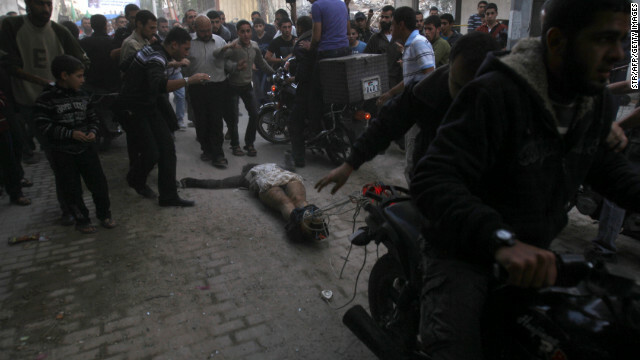 Men on motorcycles drag the body of man through the streets of Gaza City on Tuesday. 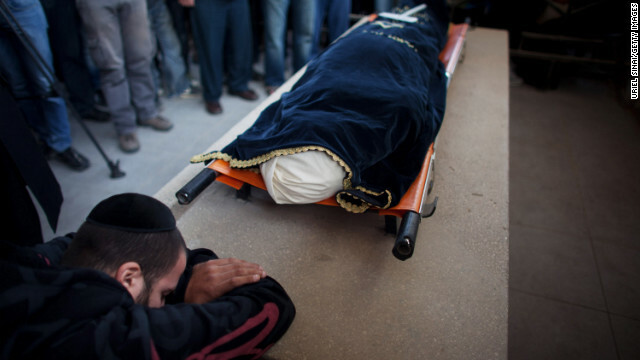 The men dragging the body claimed it was the body of a collaborator and an Israeli spy. 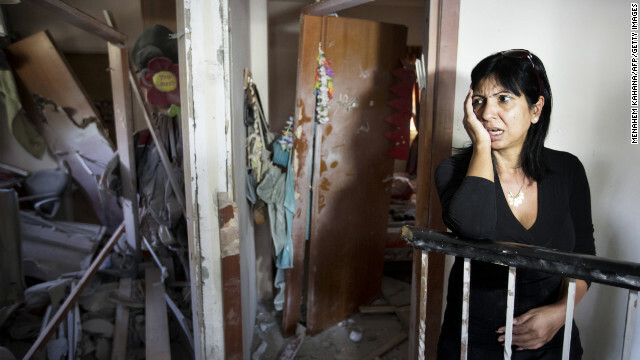 Ronit Hakmon reacts to the damage to her home in Beer Sheva, Israel, on Tuesday, after a rocket from Gaza militants hit it. 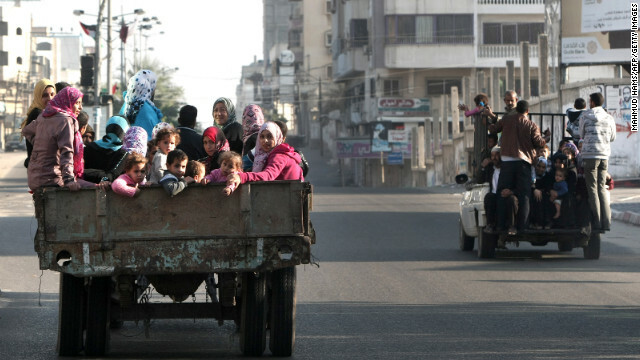 Palestinian families evacuate their homes following an Israeli airstrike Tuesday in Gaza City. 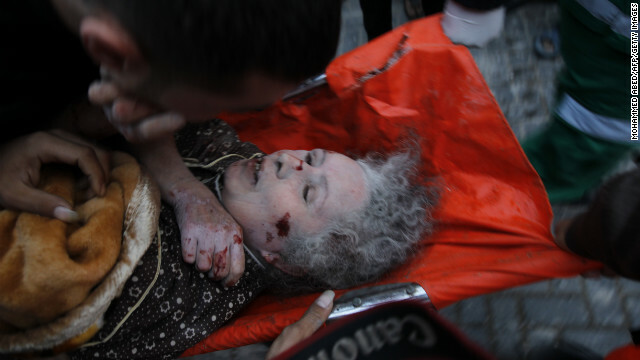 More than 100 Palestinians have been killed in the weeklong attacks, the Gaza Ministry of Health says. Four Israelis have died. 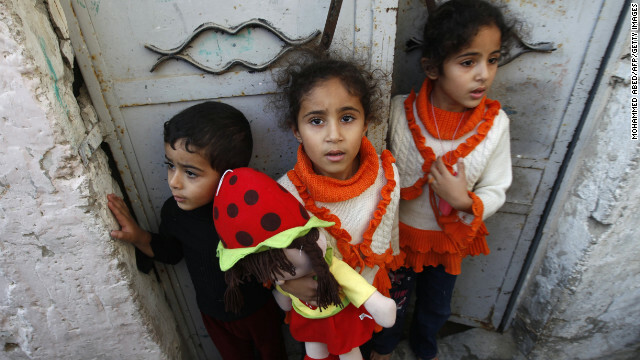 Palestinian children stand at the gate of their home Tuesday as they watch a funeral procession for those killed following an Israeli airstrike in northern Gaza. 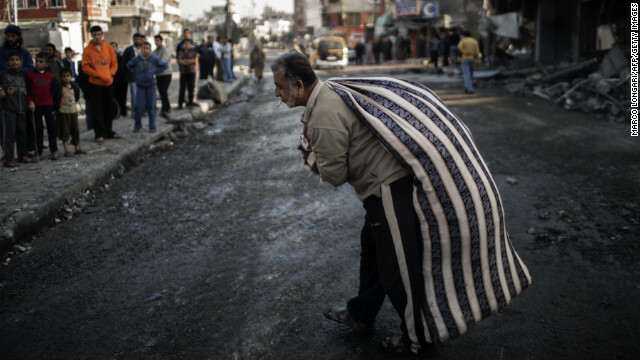 A Palestinian carries a bag of items salvaged from a house destroyed in an Israeli airstrike Tuesday on Gaza City. 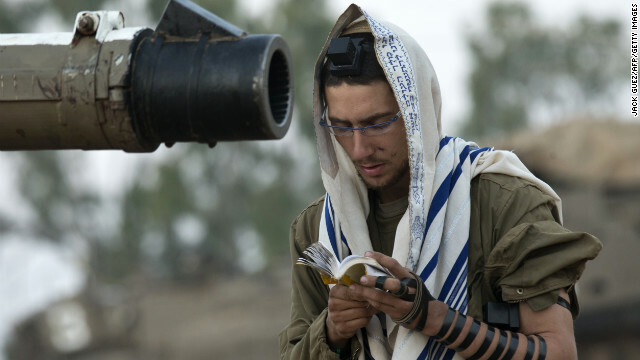 An Israeli soldier reads his morning prayers Tuesday at an Israeli army deployment area near the Israel-Gaza border as they prepare for a potential ground operation in the Palestinian coastal enclave. 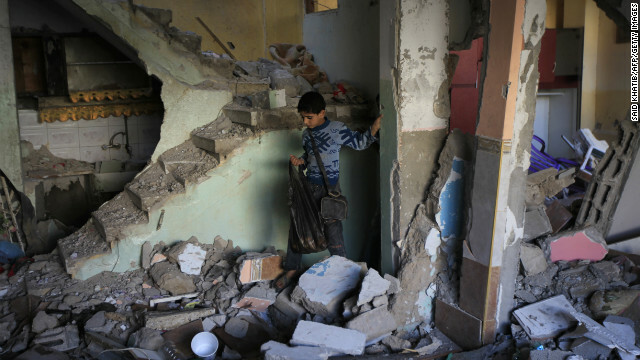 A Palestinian boy walks through the rubble of Hamas commander's house Tuesday in the southern Gaza town of Rafa. 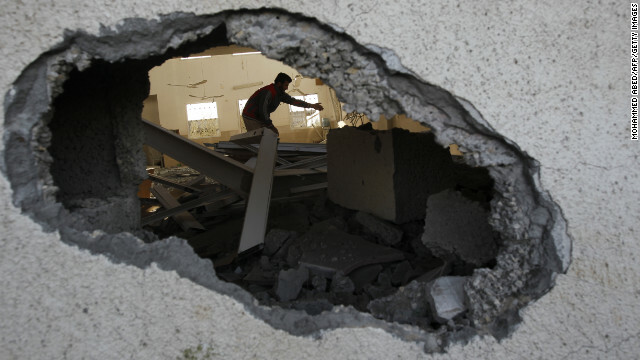 An overnight Israeli airstrike targeted the home. 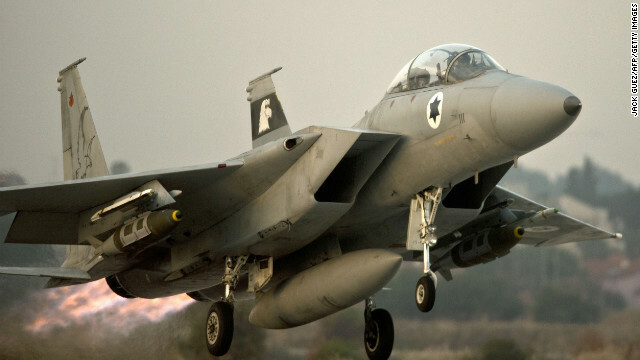 An Israeli F-15 takes off from an Israeli air force base on Monday, November 19, on a mission over the Gaza Strip. Israel carried out 80 strikes on Monday, raising to more than 1,300 the number of sites targeted since it began its bombing campaign on Wednesday, according to the Israel Defense Forces. 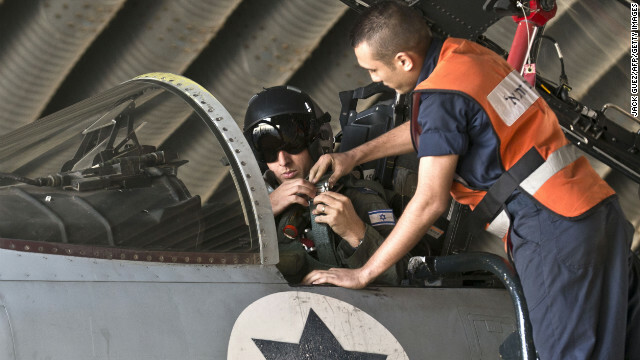 An Israeli pilot adjusts a strap as he sits in the cockpit of a jet at an air force base on Monday. 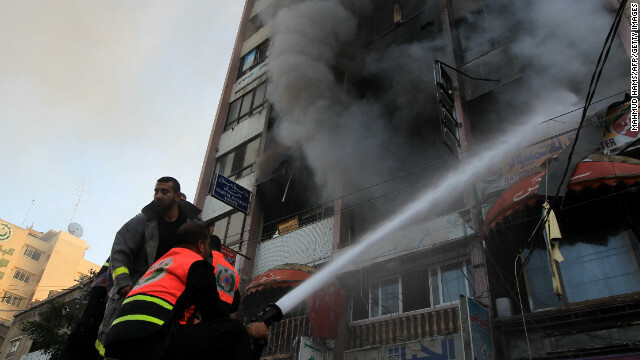 Palestinian firefighters extinguish a blaze following an Israeli airstrike in a Gaza City tower housing Palestinian and international media on Monday. 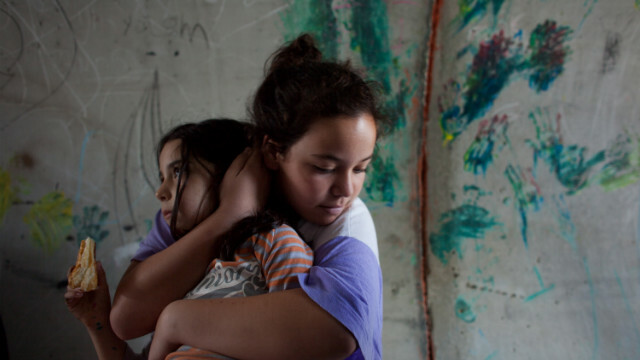 An Israeli girl holds her sister as they take cover in a large concrete pipe used as a bomb shelter during a rocket attack from the Gaza Strip on Monday in Nitzan, Israel. 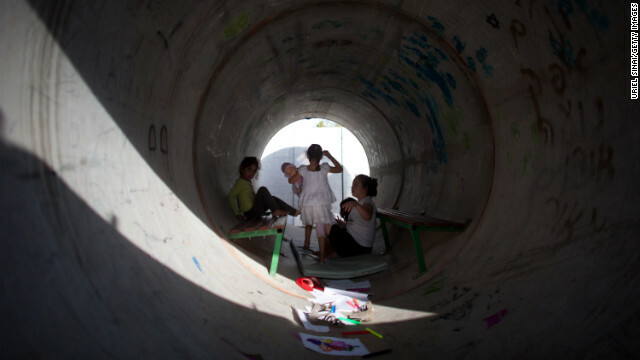 Israeli children play in a large concrete pipe used as a bomb shelter on Monday in Nitzan. 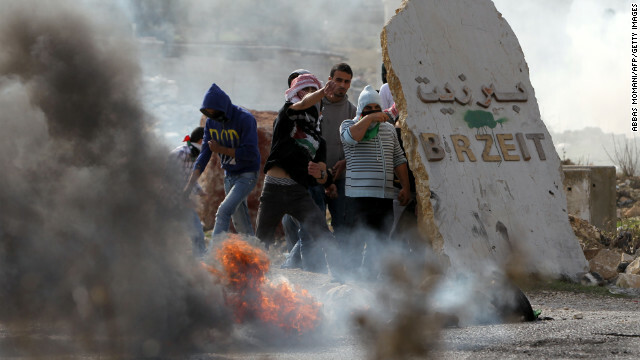 Birzeit University students clash with Israeli soldiers at the Atara checkpoint close to the West Bank university as they protest against Israel's military action on Monday. 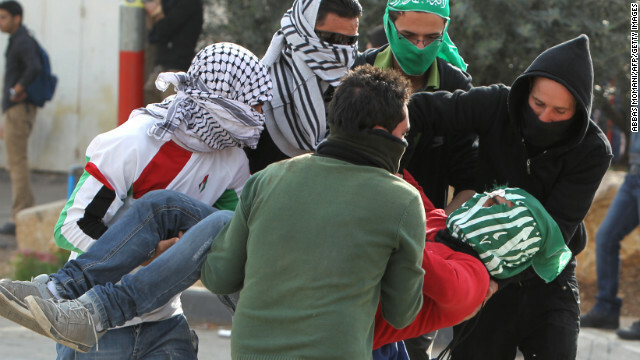 Birzeit University students clash with Israeli soldiers on Monday. Palestinian women mourn during the funeral Monday of members of one family killed when an Israeli missile struck a three-story building in Gaza City on Sunday. 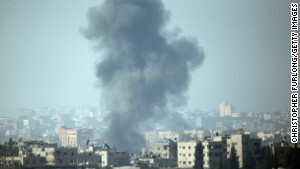 Israeli artillery shells hit a target in the Gaza Strip on Monday near Israel's border with the Gaza Strip. 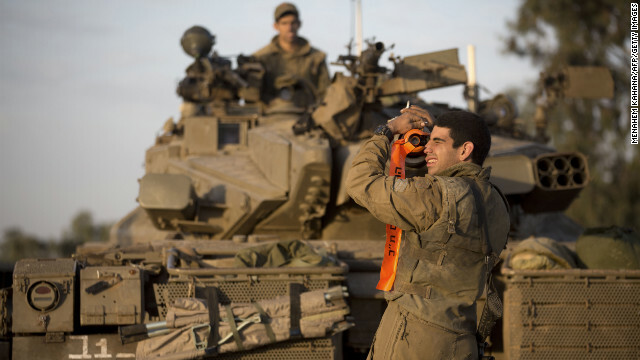 An Israeli soldier from a tank squadron attends a morning briefing at an Israeli army deployment area near the Israel-Gaza Strip border on Monday. 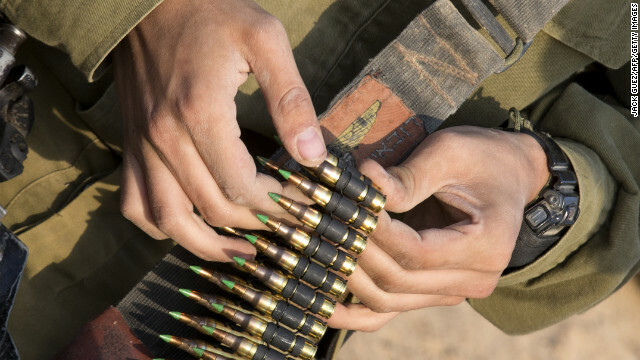 Israeli soldiers from a tank squadron prepare ammunition at an Israeli army deployment area on Monday. A paramedic helps a Palestinian woman out of her building, which was damaged during an Israeli air raid on a nearby sporting center in Gaza City on Monday. 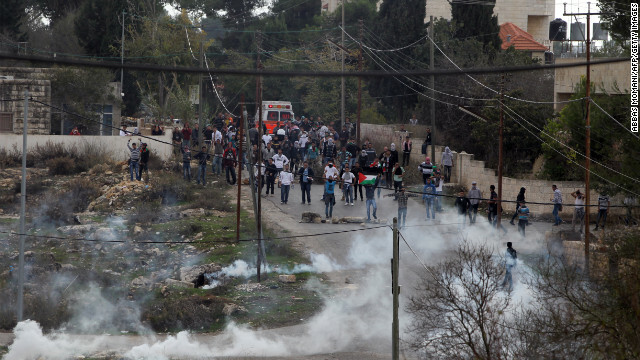 At least 90 Palestinians, including a family of 10, have been killed, officials say. 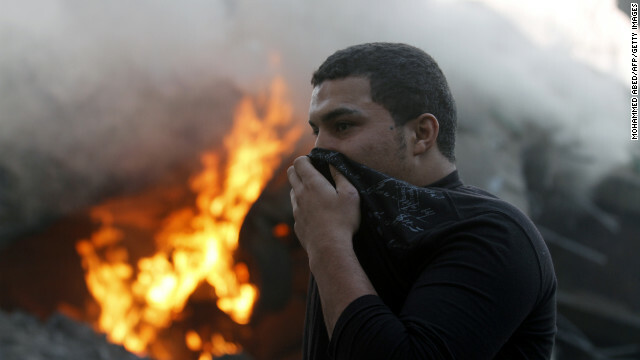 A man covers his nose and mouth as he passes burning debris after Israeli airstrikes in Gaza City on Monday. 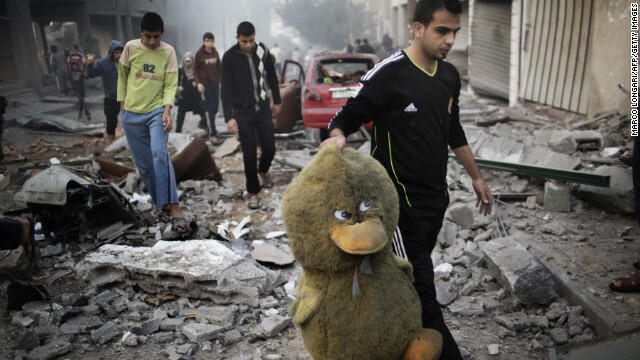 A Palestinian man carries a stuffed toy through a street littered with debris after an air raid on a sporting center in Gaza City on Monday. 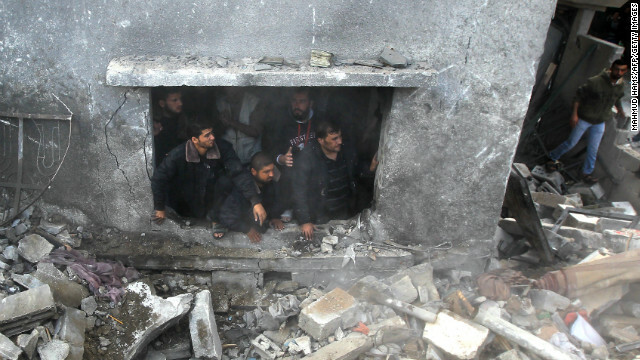 Palestinian men gather around a crater caused by an Israeli airstrike at a home in Gaza City on Sunday, November 18. Palestinian relatives grieve at the hospital in Gaza City on Sunday, November 18, over family members killed in an airstrike. 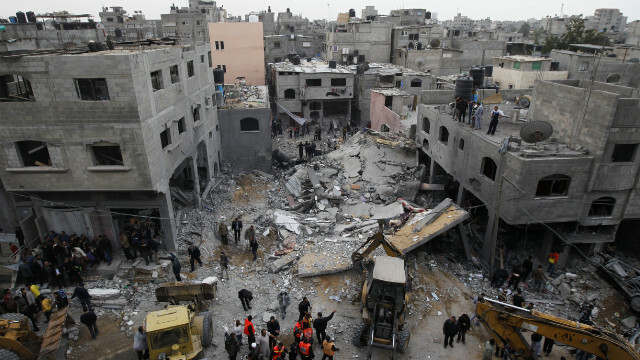 Palestinians search the debris of the home following an Israeli airstrike in Gaza City on Sunday, November 18. 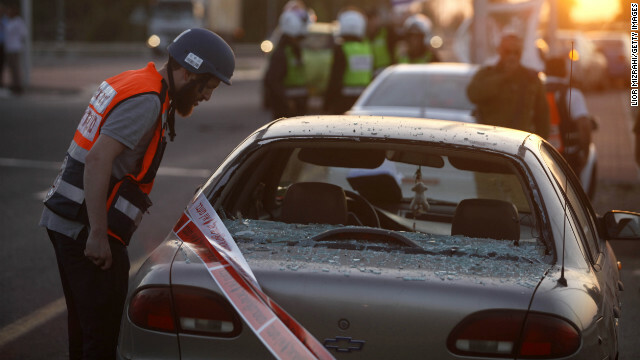 An Israeli emergency worker inspects the damage to a car in Ofakim, Israel, that was hit by a rocket fired by Palestinian militants from the Gaza Strip on Sunday, November 18. Israeli soldiers wait at an Israeli army deployment area near the Israel-Gaza Strip border on Sunday, November 18, as they prepare for a potential ground operation in the Palestinian coastal enclave. Israeli Prime Minister Benjamin Netanyahu said that Israel is ready to "significantly escalate" its operation against militants in the Hamas-run Gaza Strip. 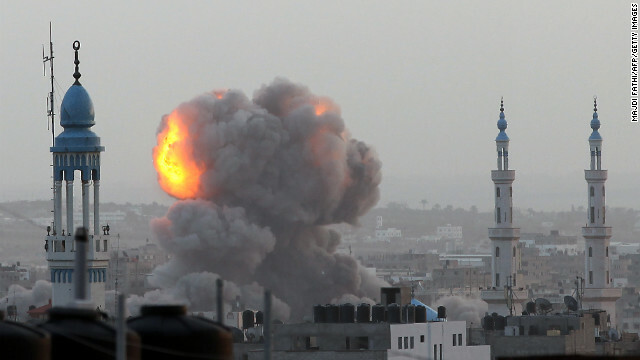 Smoke rises after an Israeli air strike on an office of Hamas television channel Al-Aqsa in the southern Gaza town of Rafah on Sunday, November 18. 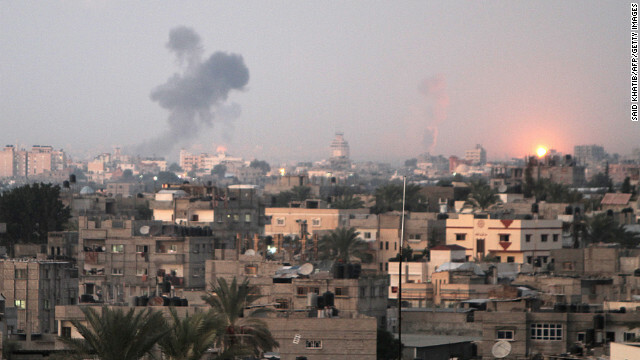 Israeli warplanes hit the Gaza City media center and homes in northern Gaza in the early morning. 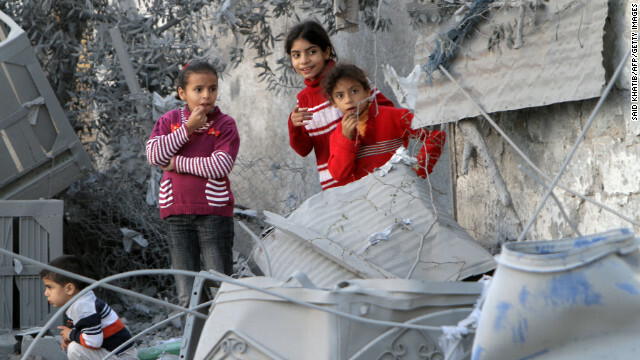 Palestinian children look at damaged buildings following Israeli air strikes Sunday, November 18, in Rafah. 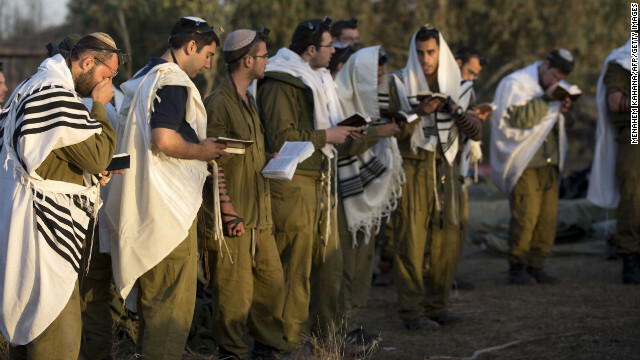 Israeli soldiers wearing prayer shawls conduct morning prayers Sunday, November 18, at an Israeli army deployment area. 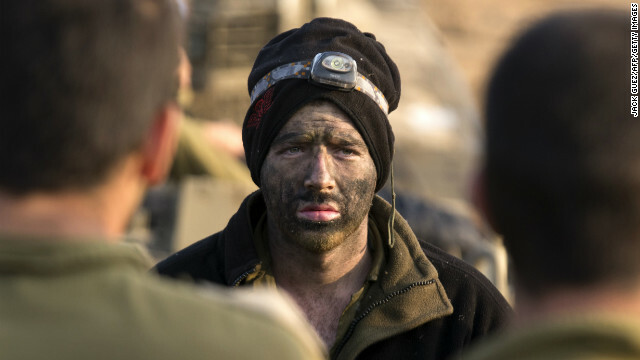 An Israeli soldier from a tank squadron adjusts the tank barrel at an Israeli army deployment area on Sunday, November 18. 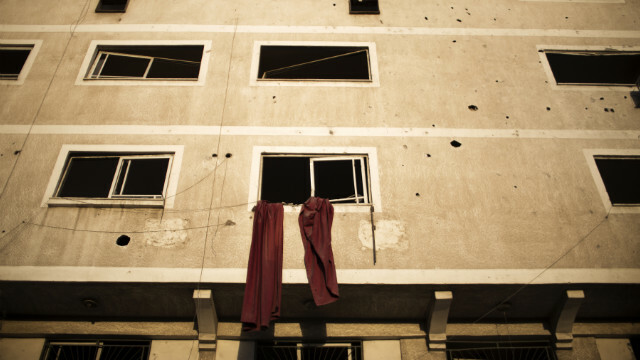 Cloth hangs from a window of a building damaged during Israeli air strikes on Gaza City on Sunday, November 18. A Palestinian demonstrator throws stones in front of the headquarters of the Palestinian security forces in the West Bank city of Jenin on Sunday, November 18, during a protest against Israel's ongoing military operation in Gaza. 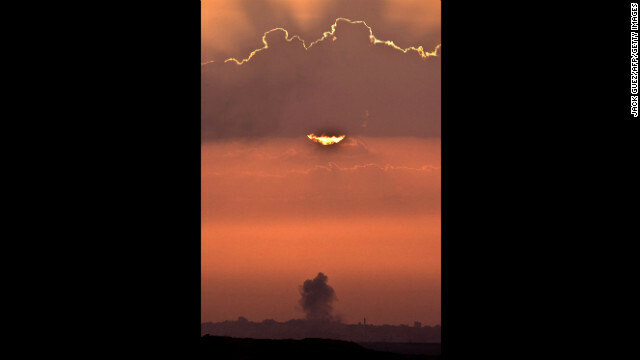 A fireball rises as the Israeli air force carries out a raid over Gaza City on Saturday, November 17. 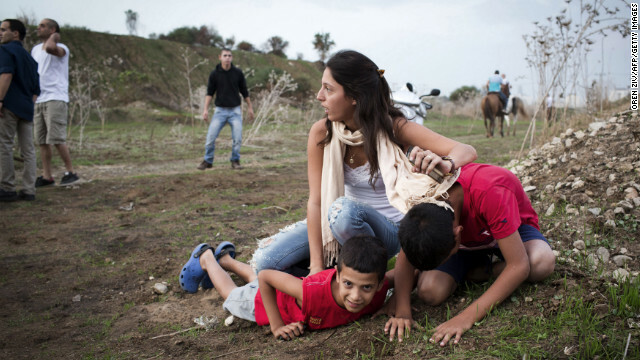 An Israeli woman and her children take cover as sirens wail in Tel Aviv on Saturday, November 17. Palestinians walk amid the debris of a burning factory near the house of Ezzedine Haddad, commander of the armed wing of the Hamas movement, after it was destroyed during an Israeli air strike on Gaza City on Saturday, November 17. A Palestinian woman helps her friend cover her face with a traditional scarf during clashes at the Hawara checkpoint in the occupied West Bank city of Nablus on Saturday, November 17. 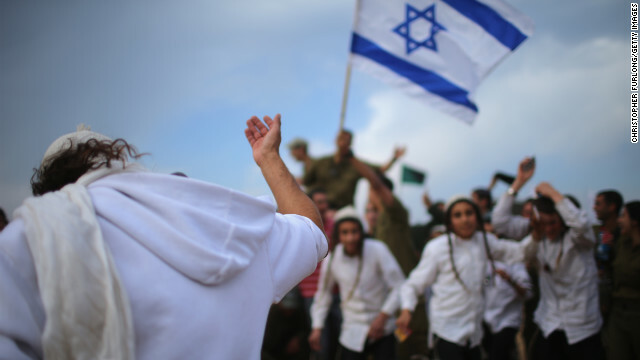 People rallied against the Israeli military operations. Palestinians stand on the rubble of the demolished home of Ezzedine Haddad, commander of the armed wing of the Hamas movement, the Ezzedine al-Qassam Brigades, that was destroyed by an Israeli airstrike in Gaza City on Saturday, November 17. Israeli air strikes in Gaza killed 10 Palestinians, five of them militants, as nine Israelis were hurt by rocket fire, four of them soldiers, medics said. 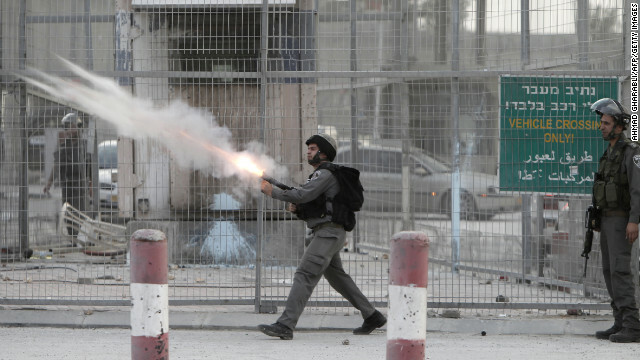 Israeli soldiers fire tear gas toward strone throwers demonstrating against the Israeli military offensive on the Gaza Strip at the Qalandia checkpoint, in the occupied West Bank, on Saturday, November 17. 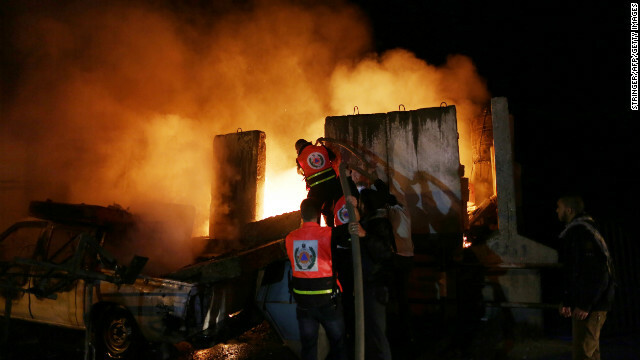 Israeli strikes on Gaza destroyed the Hamas government headquarters as Israel called up thousands more reservists for a possible ground war. 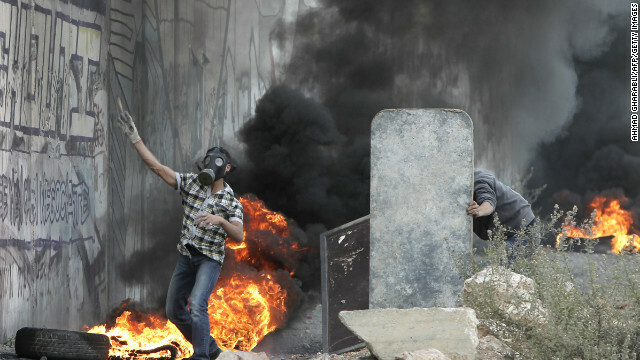 Palestinian youth clash with Israeli soldiers during protests at the Hawara checkpoin on Saturday, November 17. 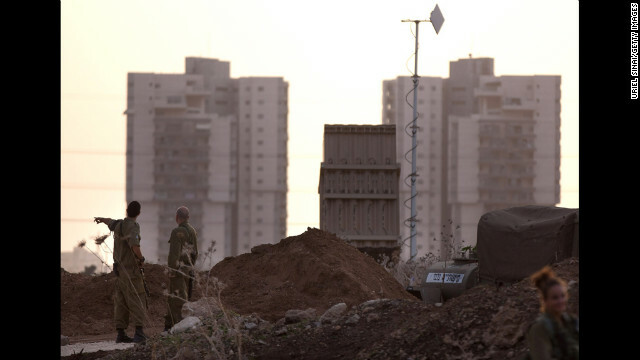 Israeli soldiers stand guard by the Iron Dome defense system launch site on Saturday, November 17, in Tel Aviv, Israel. A picture taken from the southern Israeli border with Gaza shows smoke billowing following an Israeli air strike inside the Palestinian territory on Saturday, November 17. Turkish Prime Minister Recep Tayyip Erdogan said that Israel would be held to account for the children who were among 40 people dead in three days of airstrikes on Gaza. 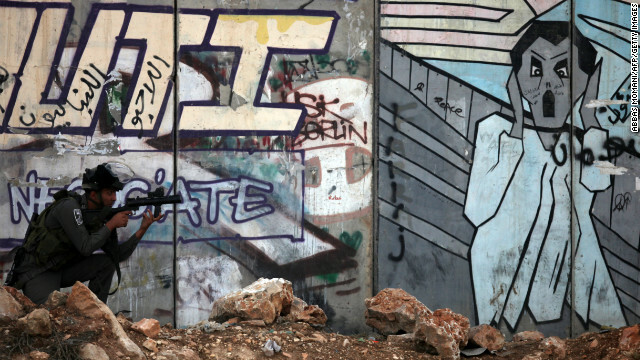 A Palestinian youth takes cover behind a makeshift barrier during clashes with Israeli soldiers on November 17. 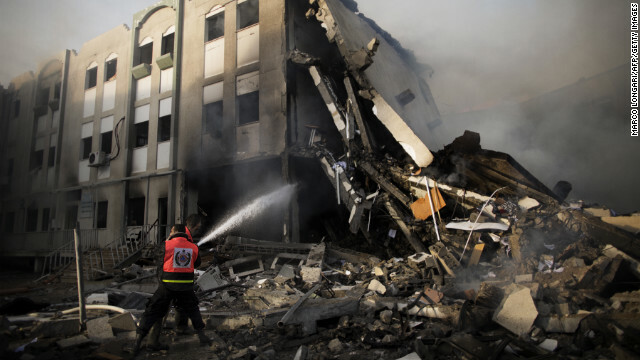 Israeli strikes on Gaza destroyed the Hamas government headquarters as Israel called up thousands more reservists for a possible ground war. An Israeli missile from the Iron Dome defense missile system is launched to intercept and destroy incoming rocket fire from Gaza on November 17 in Tel Aviv, Israel. Israeli troops have been massing on the border as some 200 targets were hit overnight in Gaza, including Hamas cabinet buildings. 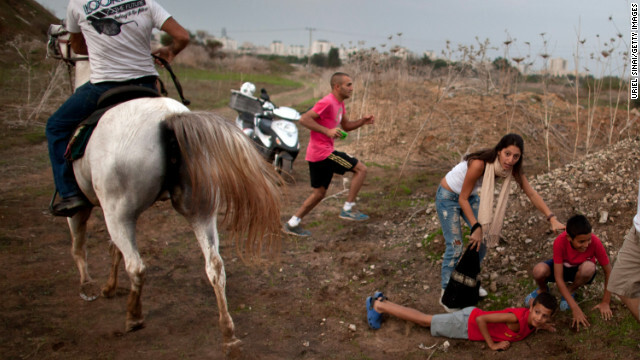 Israeli civilians run for cover during a rocket attack launched from Gaza on November 17 in Tel Aviv, Israel. 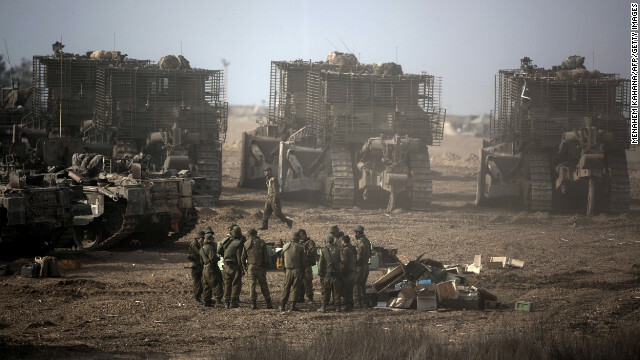 Israeli soldiers gather next to their armored bulldozers stationed on Israel's border with Gaza on Saturday, November 17. 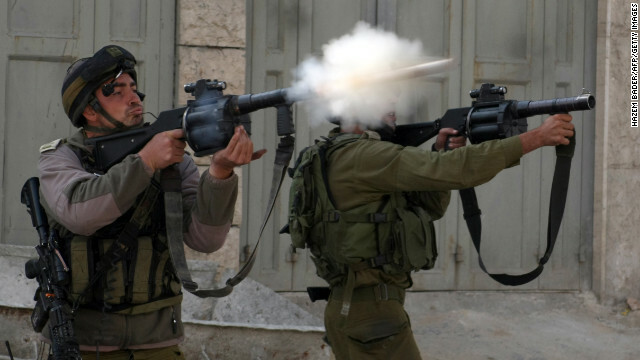 Israeli soldiers fire tear gas toward stone throwers demonstrating against the Israeli military offensive in Gaza in the village of Beit Omar, north of the West Bank town of Hebron, on Saturday, November 17. Egypt and Turkey put the onus on Israel to end the fighting around Gaza as Turkish Prime Minister Recep Tayyip Erdogan visited Cairo a day after Washington urged the two governments to pressure the Palestinians. An injured student from the University of Birzeit is carried away Saturday, November 17, during clashes with Israeli soldiers as hundreds of students took part in a demonstration against the ongoing Israeli military offensive on the Gaza Strip in the Israeli occupied West Bank town of Betunia. 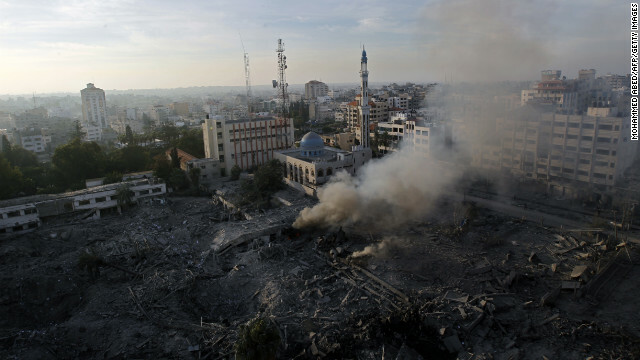 Israeli strikes on Gaza killed 10 Palestinians and destroyed the Hamas government headquarters. 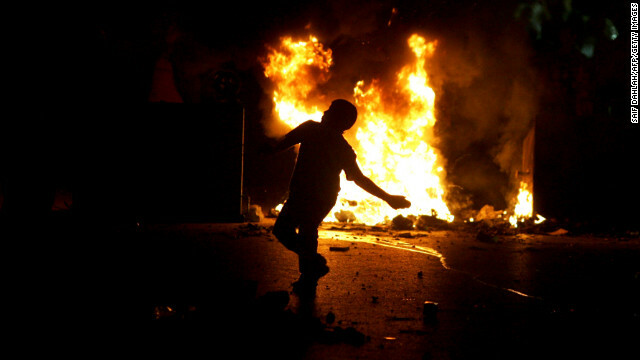 A student from the University of Birzeit throws a molotov cocktail toward Israeli soldiers during clashes. 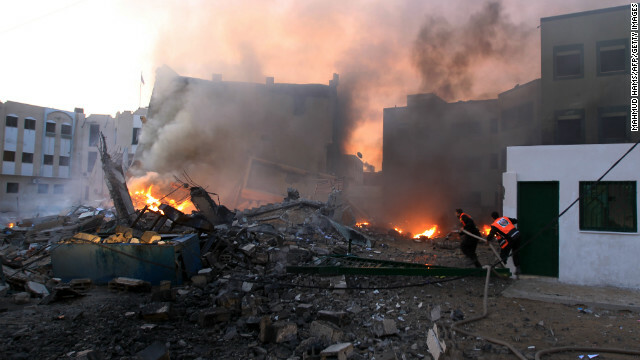 Palestinians gather at the site of an Israeli air raid in Gaza City on November 17, 2012. 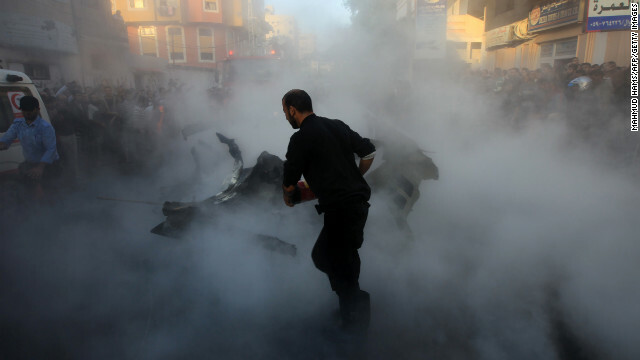 Israeli air strikes hit the cabinet headquarters of Gaza's Hamas government after militants fired rockets at Jerusalem and Tel Aviv as Israel called up thousands more reservists in readiness for a potential ground war. Palestinian paramedics carry an injured woman on a stretcher Saturday, November 17, following an Israeli air raid on a house in Beit Lahia in the northern Gaza Strip. 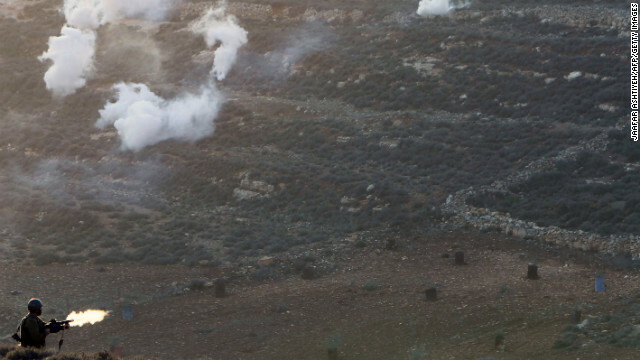 Smoke billows across the southern Israeli border with the Gaza Strip on Saturday, November 17, following Israeli air strikes inside the Palestinian territory. 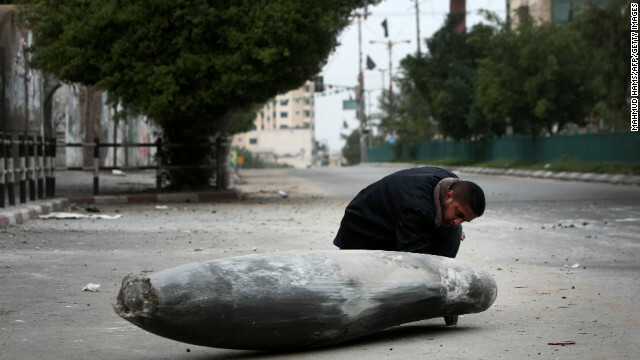 A Palestinian Hamas policeman looks at an Israeli rocket in the street in Gaza City on Saturday, November 17. 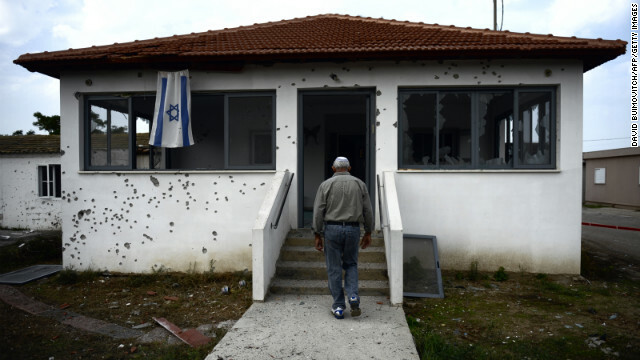 An Israeli man walks to his house damaged by a rocket fired by Palestinian militants from the Gaza Strip in the moshav of Sde Uziyahu near the southern Israeli city of Ashdod. 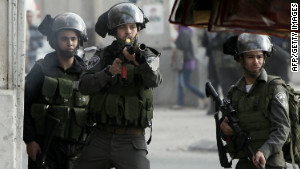 The Israeli military said it had sealed off all main roads around Gaza and declared a closed military zone, in the latest sign it was poised to launch a first ground offensive on the Palestinian enclave since December 2008-January 2009. 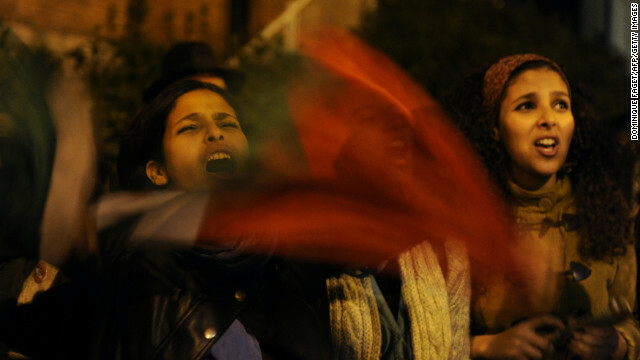 Pro-Palestinian demonstrators protest near the Israeli Embassy in Madrid on Friday, November 16, against Israel's aerial bombardment of the Gaza Strip. Israeli children wave their national flag Saturday, November 17, as they greet a bus carrying soldiers on a road leading to the Israel-Gaza border near the southern Israeli town of Ofakim. 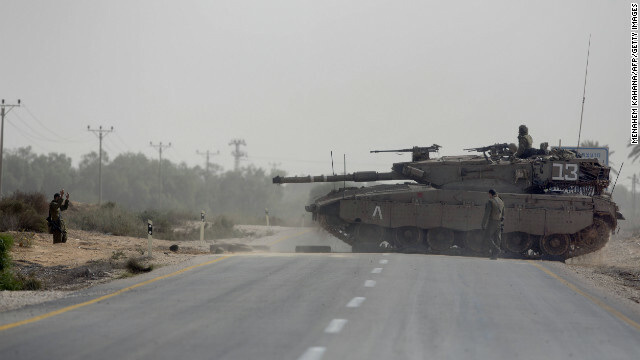 Israeli tanks maneuver at the Israeli-Gaza Strip border. 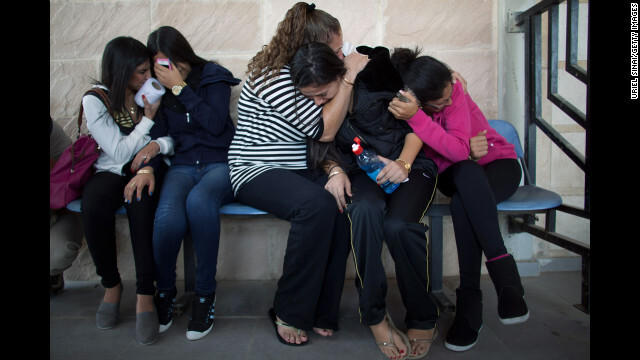 Relatives take cover from a rocket attack during the funeral for Itzik Amsalem in Kiryat Malachi, Israel, on Friday, November 16. 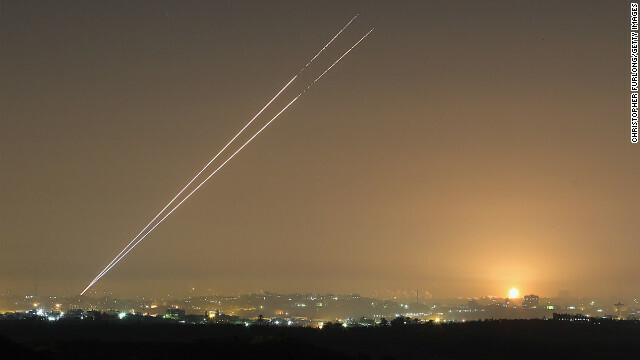 A rocket fired from Gaza toward Israel sails into the air Friday, November 16. 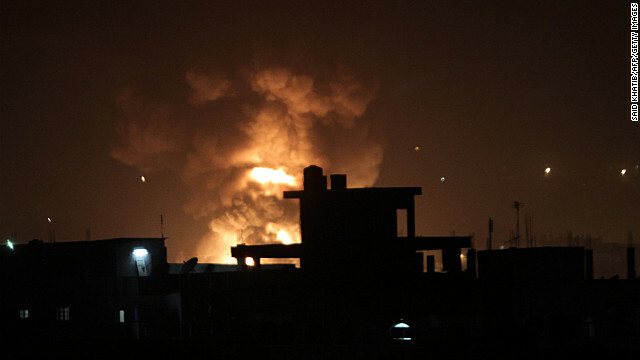 Explosions erupt from spots targeted by Israeli airstrikes inside Gaza on Friday, November 16. Israeli soldiers stand guard while explosives experts examine the site where a rocket fired from the Gaza Strip landed near the Jewish settlement of Gush Etzion in the village of Kisan, south of Bethlehem on Friday, November 16. 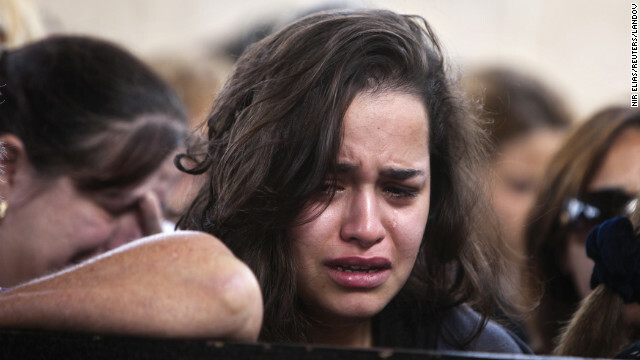 A relative grieves during the funeral for Itzik Amsalem in Kiryat Malakhi, Israel, on Friday, November 16. Palestinian protesters hold up the Hamas flag during a rally Friday, November 16, in the West Bank city of Ramallah. 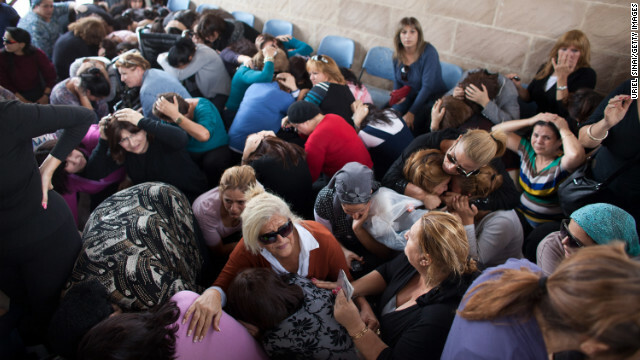 People take cover during a rocket attack at a funeral Friday, November 16, in Kiryat Malakhi, Israel. 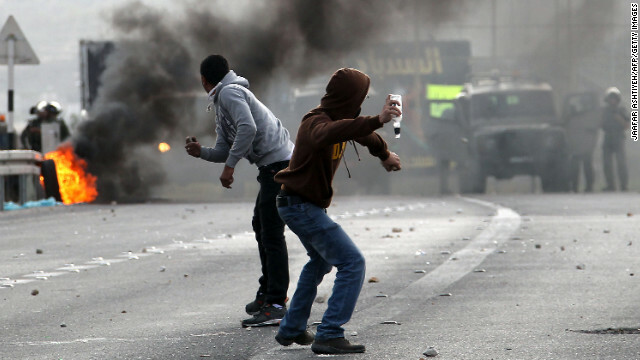 Palestinian youths throw stones at Israeli security forces Friday, November 16, in a West Bank village near Bethlehem. An Israeli soldier aims at Palestinian youth at a West Bank checkpoint Friday, November 16, during a protest against the fighting in Gaza. Palestinian Fares Sadallah, 11, cries outside his home after an Israeli airstrike Friday, November 16, in northern Gaza. 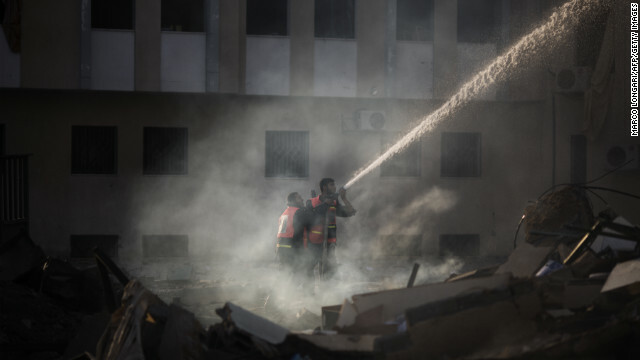 Palestinian firefighters try to extinguish a blaze Friday, November 16, at the Ministry of Interior in Gaza City following an Israeli air raid. 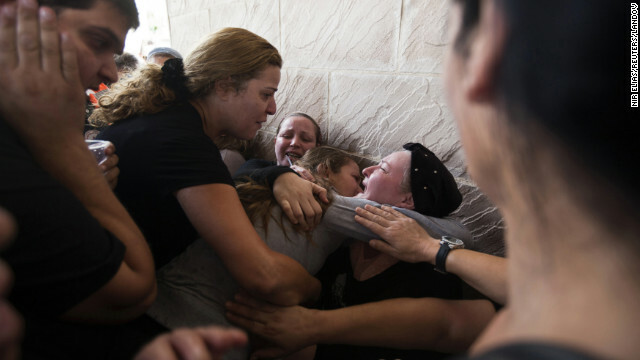 Relatives of Itzik Amsalam, who was killed Thursday, November 15, in Kiryat Malakhi, Israel, mourn during the funeral on Friday, November 16..
A woman cries during the funeral of Itzik Amsalam on Friday, November 16. An Israeli soldier fires a tear gas canister toward Palestinian stone throwers on a road mainly used by Israeli settlers in the West Bank village of Beit Omar on Friday, November 16. 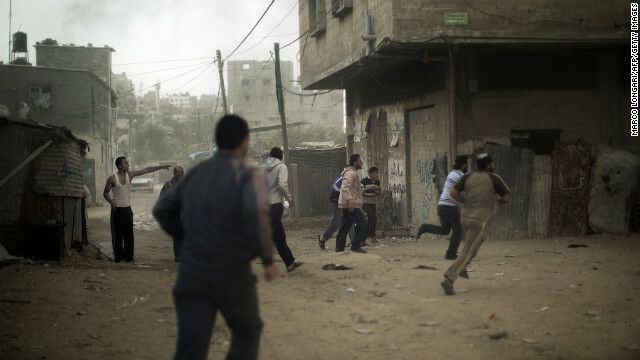 Palestinians run for cover after an Israeli airstrike hits Gaza City on Friday, November 16. 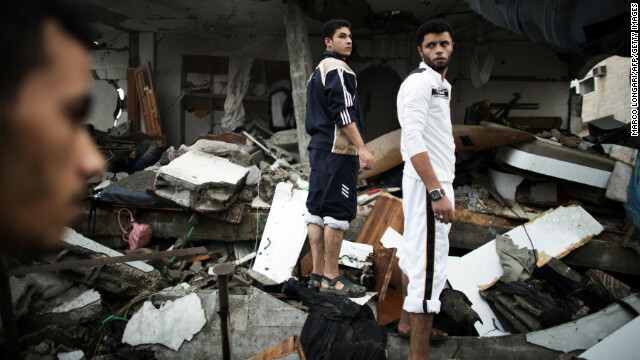 Palestinian youths inspect a destroyed mosque in northern Gaza on Friday, November 16. 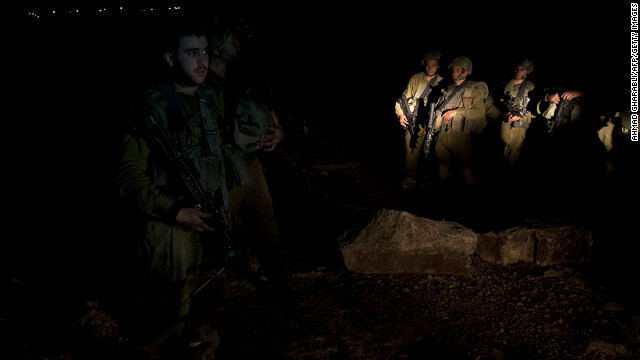 Israeli soldiers conduct a patrol as some 16,000 reserve troops are drafted in on Friday, November 16. 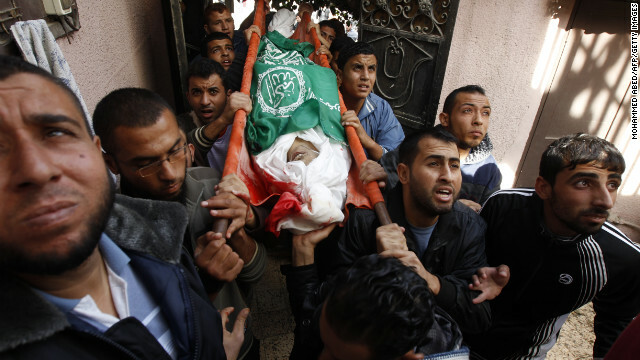 Palestinian mourners carry the body of Audi Naser during his funeral in Gaza on Friday, November 16. 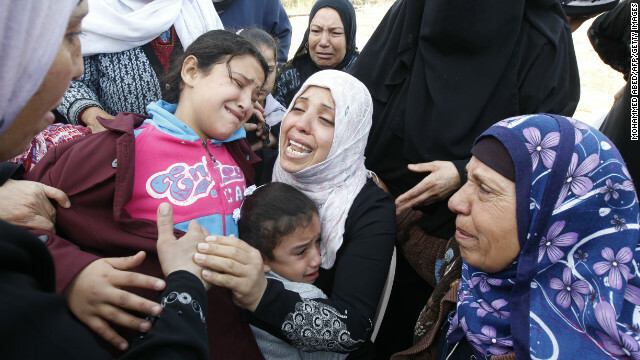 Palestinian women and children cry during the funeral of Audi Naser on Friday, November 16. Palestinian firefighters try to extinguish a fire at the Civilian Affairs branch of the Ministry of Interior on Friday, November 16. Smokes billows from a target of an Israeli airstrike Friday, November 16, in Gaza near the border with Israel. 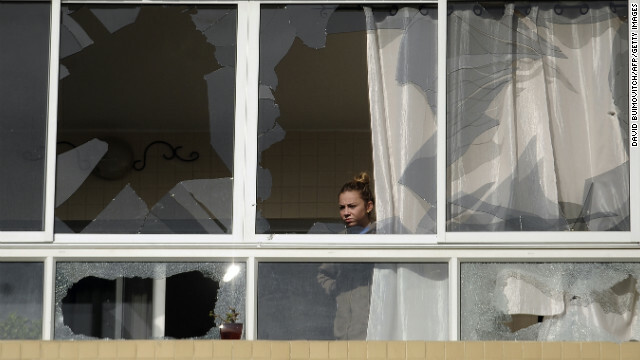 An Israeli woman looks out from an apartment building in Ashdod, Israel, damaged by a rocket fired by Palestinian militants on Friday, November 16. Palestinians extinguish a fire after Israeli airstrikes targeted the Interior Ministry building in Gaza City Friday, November 16. Israelis take cover in a pipe used as a bomb shelter, after a rocket was launched from the Gaza Strip on Thursday, November 15, in Kiryat Malachi, Israel. An Israeli man looks out from an apartment building that was hit by a rocket launched presumably from the Gaza Strip, claiming three lives on Thursday, November 15, in Kiryat Malachi, Israel. 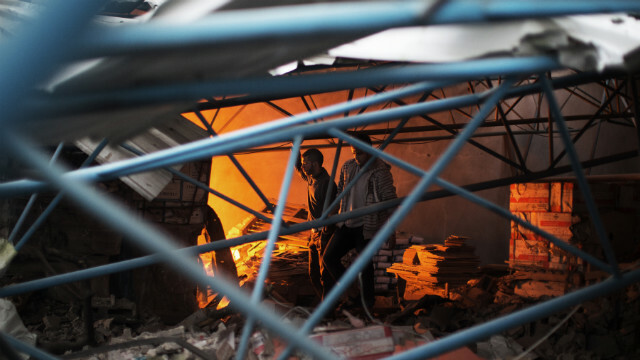 Palestinians extinguish a fire after Israeli air strikes targeted an electricity generator that fed the house of Hamas's Prime Minister Ismail Haniyeh in Gaza City, on Thursday, November 15. 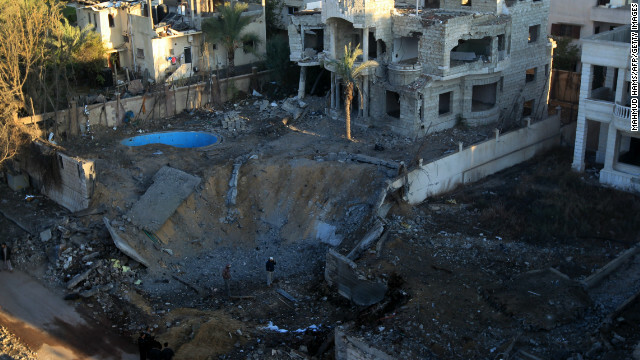 A crater is left at a spot targeted by an Israeli airstrike in Gaza City early Thursday, November 15. 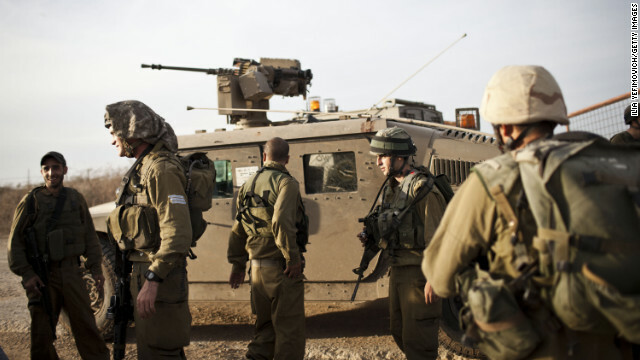 Israeli soldiers rest by their armored personnel carriers stationed on the Israel-Gaza border on Thursday, November 15. Rescue workers evacuate a body Thursday, November 15, in the Israeli town of Kiryat Malakhi after a rocket launched from Gaza hit an apartment building. 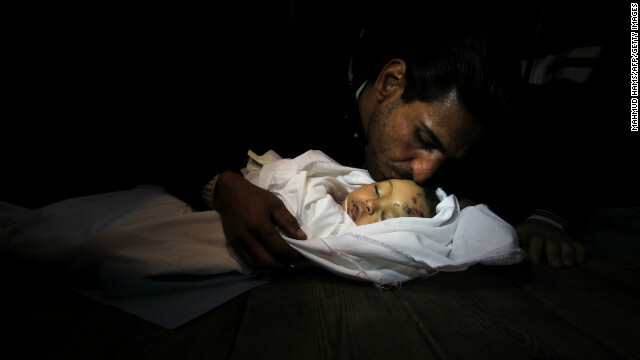 Palestinian relatives mourn over the body of Hanen Tafish, a 10-month-old girl, at the morgue of the al-Shifa hospital in Gaza City on Thursday, November 15, after she died following an Israeli air strike in the Zeitun neighbourhood. Palestinians watch a funeral Thursday, November 15, in southern Gaza. A Palestinian pleads for help as he and others try to save a man trapped under his car after an Israeli air raid Thursday, November 15, in northern Gaza. 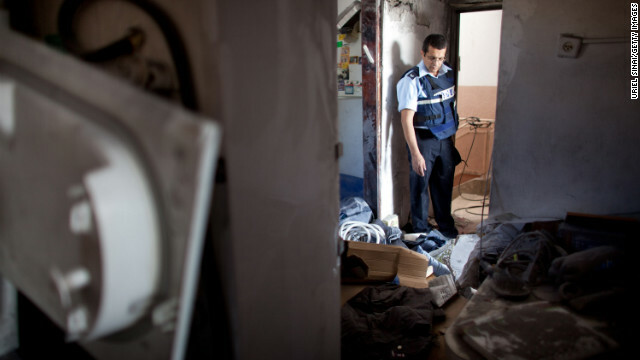 Israeli police inspect an apartment building hit by a rocket fired by Palestinian militants in Kiryat Malakhi on Thursday, November 15. 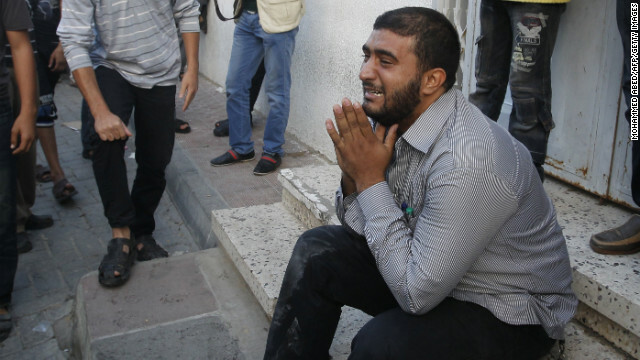 At least three Israelis were killed and four were wounded, an Israeli police spokesman said. 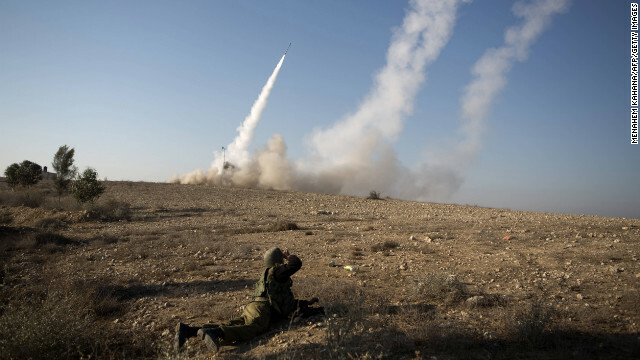 The Israeli military launches a missile Thursday, November 15, from the southern city of Beersheba. A picture taken from the southern Israeli town of Sderot shows smoke billowing from a spot targeted by an Israeli airstrike inside Gaza on Thursday, November 15. 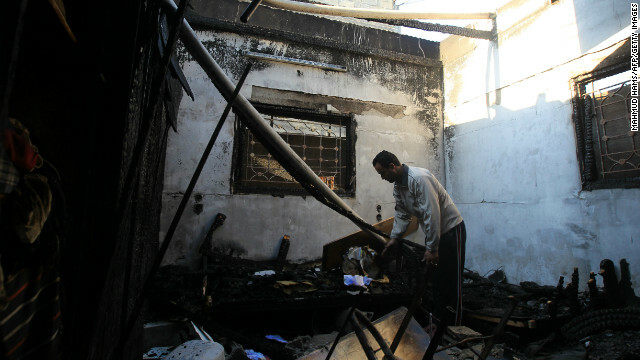 A Palestinian man inspects his damaged house following an Israeli airstrike early Thursday, November 15, in Gaza City. 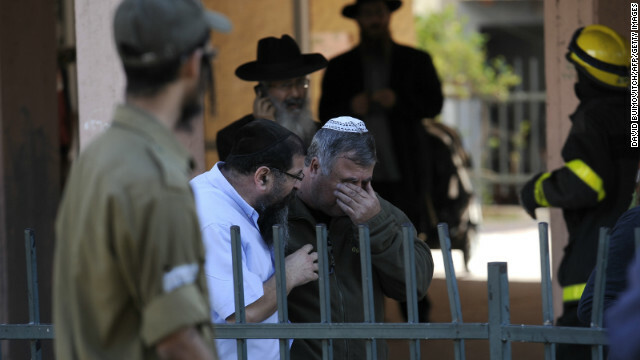 An Israeli reacts after a rocket launched from Gaza hits a building Thursday, November 15, in Kiryat Malakhi. 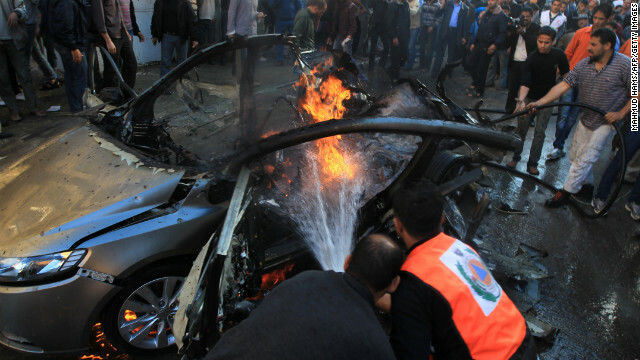 Palestinian firefighters extinguish the blaze from the car of Ahmed al-Jaabari, head of Hamas' military wing, after an Israeli airstrike hit it in Gaza City on Wednesday, November 14. 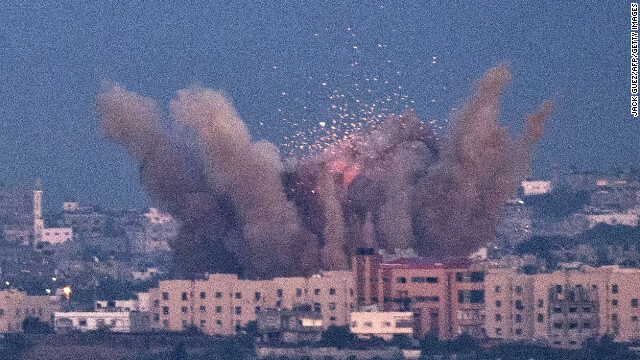 The Israeli strike killed al-Jaabari. 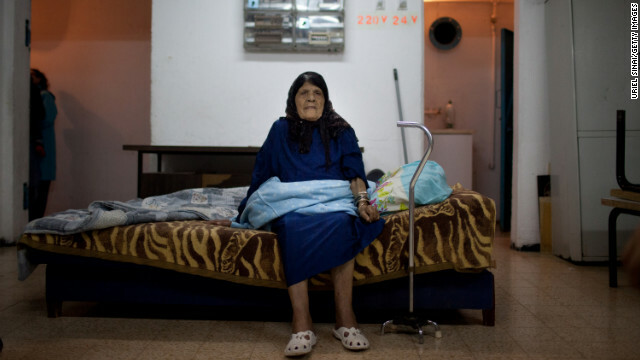 A woman sits inside a bomb shelter Wednesday, November 14, in Netivot, Israel. 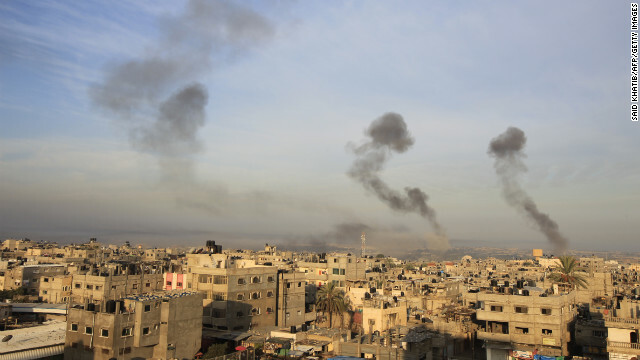 Smoke rises following an Israeli airstrike Wednesday, November 14, in Khan Younis, Gaza. Palestinian firefighters extinguish fire from the car in which al-Jaabari was apparently riding. 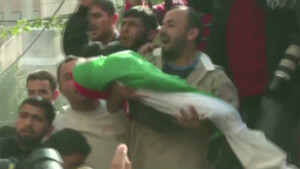 A Palestinian man cries as security forces wheel al-Jaabari's body into a hospital. Palestinian youths look inside a building where al-Jaabari's body was brought after the attack. 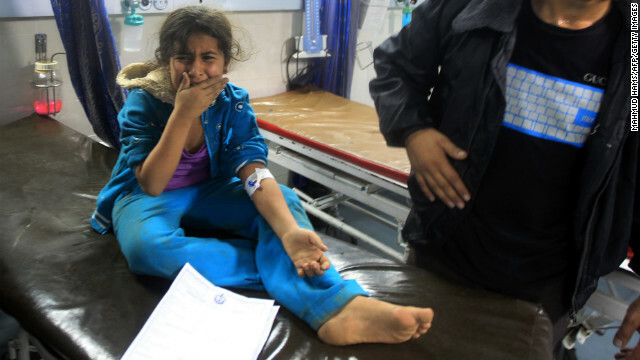 A wounded Palestinian girl cries at the Al-Shifa Hospital in Gaza City. 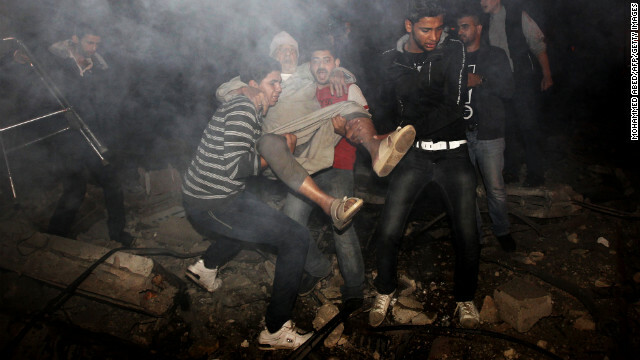 Palestinian youths evacuate an elderly man following an Israeli airstrike. 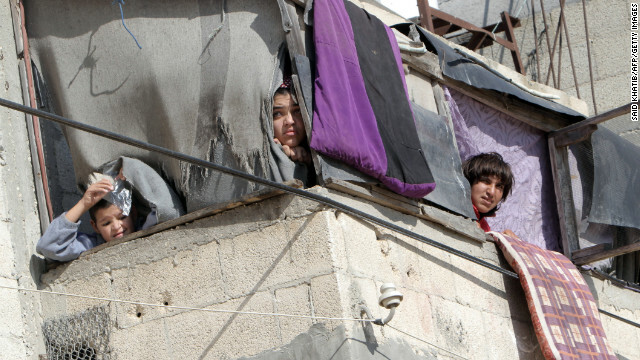 Palestinian civilians leave their houses following an Israeli airstrike. 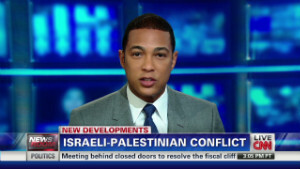 CNN has multiple crews in Gaza, Israel and neighboring countries to bring you the latest accurate information on the conflict, the impact on people and talks to stop the violence. Turn to CNN TV and http://CNN.com for what you need to know now and watch AC360º tonight at 8 ET. 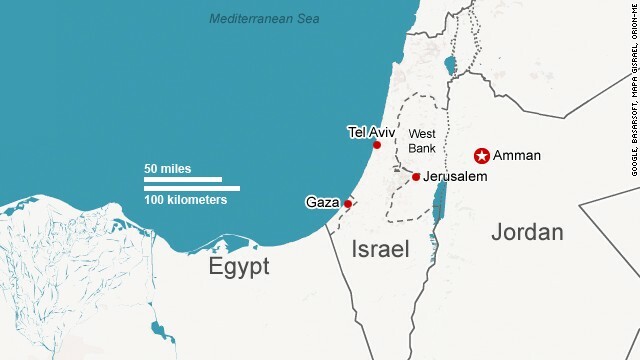 Gaza City (CNN) -- For six days, Israel has carried out a large-scale air offensive in Gaza, aiming to halt destructive and sometimes deadly rocket launches emanating from the Palestinian territory. Monday saw more carnage, more heated words and more damage on both sides. There was also more movement toward a possible intensification as Michael Oren, Israel's ambassador to the United States, said Israel had finished its planning for a ground invasion of Gaza. 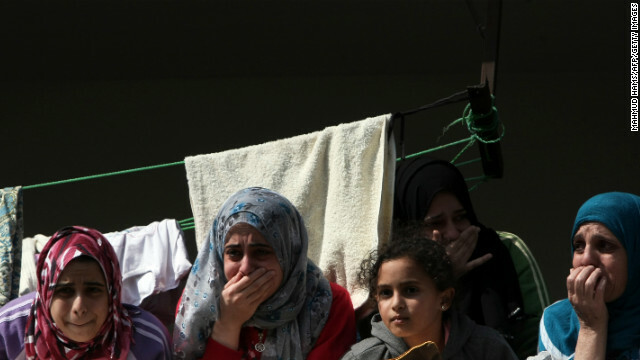 If Israeli troops do invade, Hamas leader Khaled Meshaal said it would "not be a picnic." "We do not want escalation, nor do we call for a ground war," he said Monday. "But we are not afraid of it, nor will we back down." All this violence and rhetoric has intensified international efforts to find a diplomatic solution to the crisis, starting with a cease-fire. 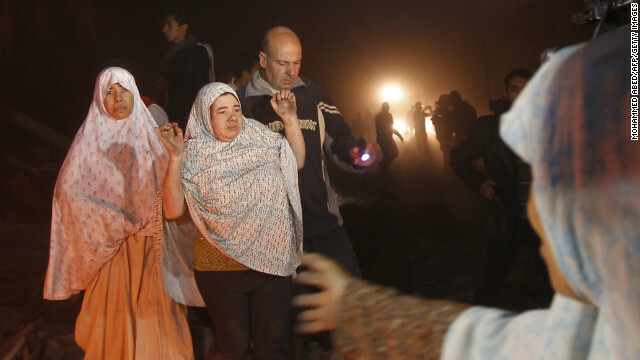 "This must stop," U.N. Secretary-General Ban Ki-moon said late Sunday. A steady stream of U.N. and European diplomats have and will be traversing the region trying to calm the situation. On Monday, Ban and an Israeli delegation went to Egypt, where that nation's top intelligence official presented Israel a letter outlining Hamas' proposal for a cease-fire, said a general in Egyptian intelligence who is optimistic about a deal being reached. The fighting has challenged Israel's relationship with Egypt, yet Israeli President Shimon Peres on Monday praised Egyptian President Mohamed Morsy for playing a "constructive role." Israeli foreign ministry spokesman Yigal Palmor confirmed late Monday that "negotiations are going on" that may lead to a cease-fire, though he didn't offer any details. Meanwhile, Arab League Secretary-General Nabil el-Araby and 16 foreign ministers from the league's member states were to arrive in Gaza on Tuesday, to be joined by Turkish Foreign Minister Ahmet Davutoglu, a spokesman for the organization said. 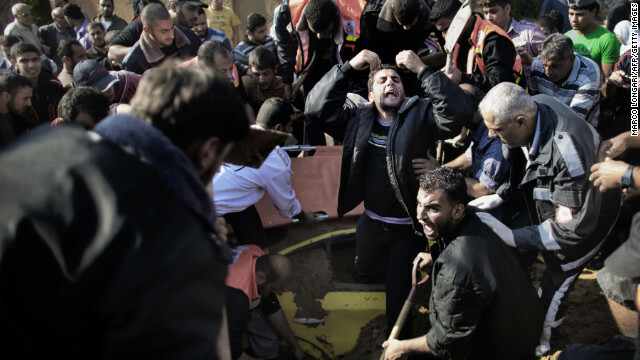 Gaza itself has been under a crippling economic embargo since Hamas won control of the territory from the Fatah-led Palestinian Authority, which controls the West Bank, after a landslide 2007 election that was followed by intra-Palestinian clashes. The United States, Israel and the European Union characterize the militant fundamentalist Islamic organization Hamas as a terrorist group. In the West Bank, Palestinian Authority President Mahmoud Abbas will hold talks with the U.N. secretary-general, according to Saeb Erakat, a member of the PLO's executive committee and an Abbas ally. The West Bank has been relatively quiet, though a Palestinian protester did die Monday -- two days after he and others clashed with Israeli troops -- Ramallah Medical hospital director Ahmad Bitawi said. 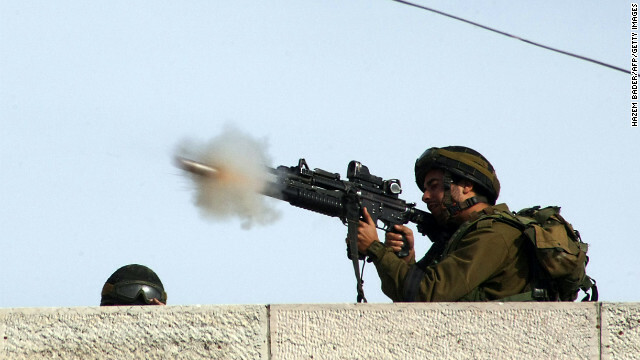 And Israeli troops shot and killed a 22-year-old Palestinian near Hebron, witnesses said. Diplomats hope to avoid a repeat of 2008, when at least 1,400 died as Israeli troops invaded Gaza after a similar spate of rocket attacks. 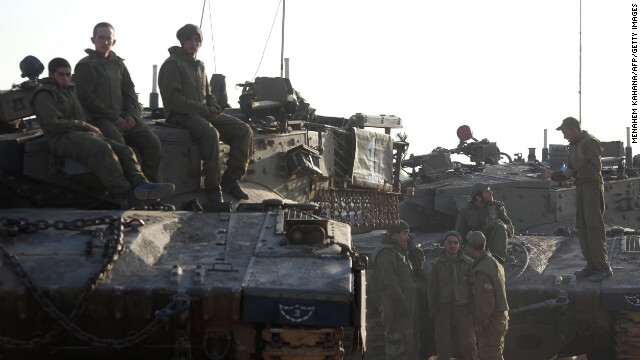 Israel has signaled it is open to a cease-fire, but only if Gaza militants halt rocket attacks. 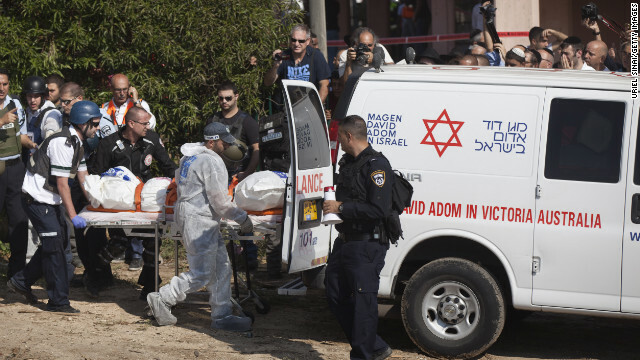 Air raid sirens yet again resounded all day Monday around Israel, where rocket attacks have killed three and wounded 68 according to Israeli officials. 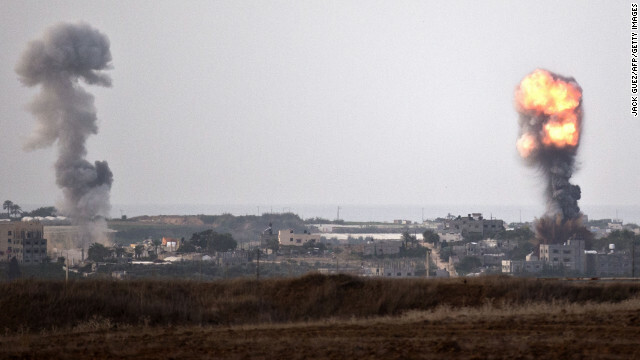 The bloodshed might be worse if not for the "Iron Dome," Israel's missile defense system that has intercepted about 30% of the rockets fired from Gaza since last week, including more than half the 67 fired on Monday, according to the Israel Defense Forces. 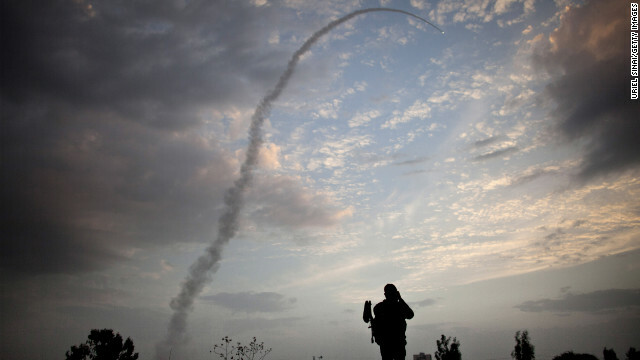 The missile defense system intercepted several more rockets fired Monday at Ashkelon, the IDF said. 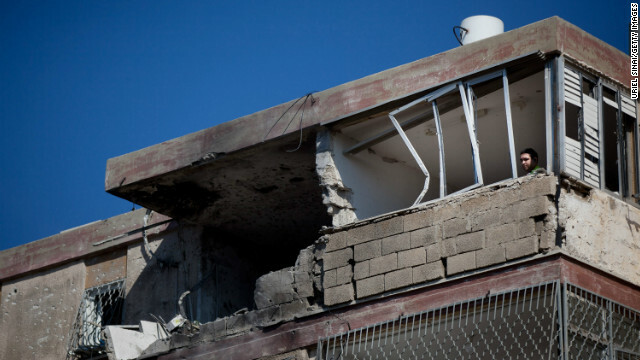 But several rockets hit Eshkol, also in southern Israel, with one striking a closed school. "They have a choice. 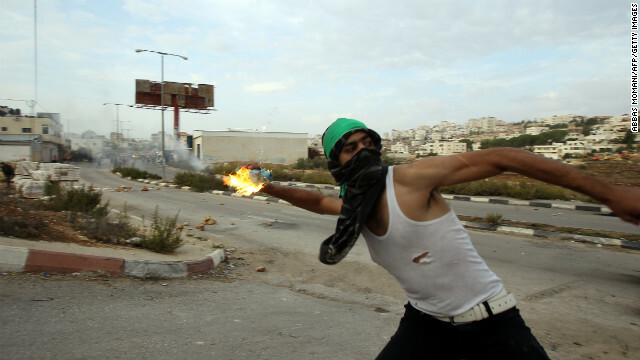 The minute they will stop (shooting), it will stop," Peres said. 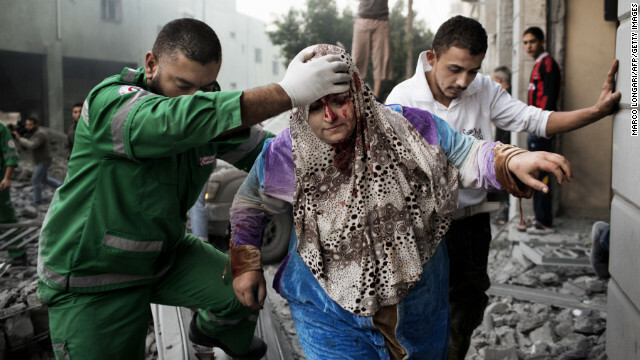 Israeli government spokesman Mark Regev said a short-term "Band-Aid" solution won't do. "There's no doubt that Hamas would agree to an immediate cease-fire, but it wouldn't mean anything. We want to know when it's over, that it's really over," he said, adding Israel will use diplomacy or military force -- whatever is necessary -- to ensure that southern Israel doesn't continue to face the threat of rockets. Like Regev, Qatari Prime Minister Sheikh Hamad Bin Jassim al Thani said there can't be a repeat of 2008 -- though he has a different view as to why. Having gone to Gaza a few weeks ago and observed "the miserable life" of residents there, Sheikh al Thani told CNN's Christiane Amanpour it's not tenable for there to be more assassinations of Hamas leaders and Israeli forces surrounding Gaza, as was the case four years ago. 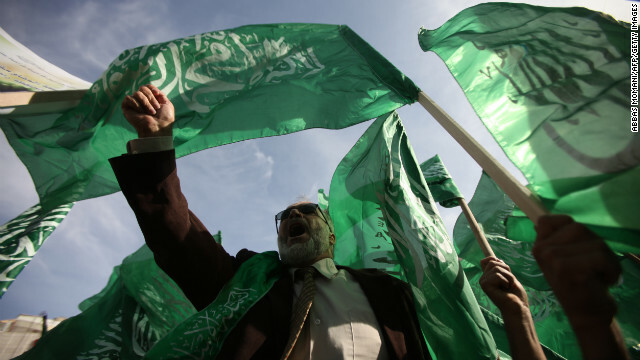 "(Hamas wants) a complete package for the cease-fire," he said. 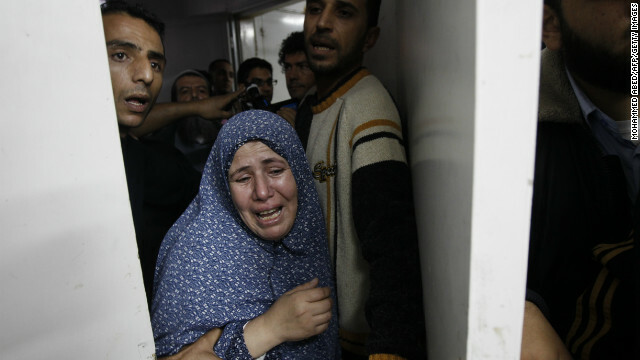 Palestinian health officials said 104 people, among them women and children, have been killed -- at least 24 on Monday. 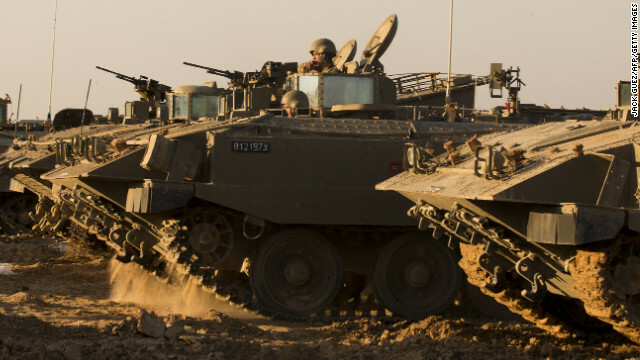 They also say 860 have been wounded in Gaza since Israel began its offensive in response to what Israel characterized as incessant rocket attacks by militants. 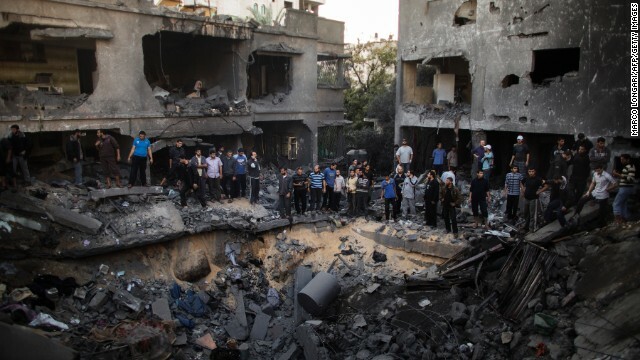 Israeli authorities say they take great pains to avoid civilian casualties, though this is difficult to do when rockets are being launched from densely populated civilian areas, where suspected militant leaders are also based. While saying he feels an agreement can be reached, Palestinian parliament member Mustafa Barghouti says he blames Israel for the bloodshed thus far. "The problem is that Israel is using the bombardment of civilians and the killing of children as a tool of negotiations," he said. Smoke and fire poured from Gaza buildings that had been struck by Israeli warplanes or drone on Monday, when Israel's military said it carried out 80 strikes in addition to the 1,300 executed since last Wednesday. 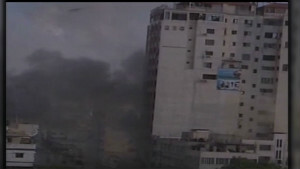 Aqsa TV, Hamas' television station, reported that Israeli tanks were firing into Beit Hanoun in northern Gaza, with one of its reporters saying that the Islamic National Bank in Gaza City had been hit. A Gaza City stadium, where the IDF said Hamas militants launched rockets toward Israel three days ago, was among the sites hit on Monday. Israeli forces also hit a Gaza City office building used by some media outlets -- as they had Sunday -- killing two, including the head of the Palestinian Islamic Jihad's military media office. That strike targeted four senior Islamic Jihad members who Israel's military said were hiding in the building, including the information chief, Israel's military said. The others were described as key figures in military training, attack planning, long-range rocket operations and arms manufacturing within the same organization. "We targeted only the second floor, which is where the senior terrorists were," the IDF said on Twitter, adding that reporters had been used as human shields. "The rest of the building was unharmed. Direct hit confirmed." Calls for a truce came on the heels of the single deadliest attack -- an Israeli airstrike in Gaza City on Sunday that left a family of 10 dead within a building's broken concrete and mangled metal. Al Qassam Brigades, Hamas' military arm, called it a "massacre committed by Israeli occupation" on Twitter. 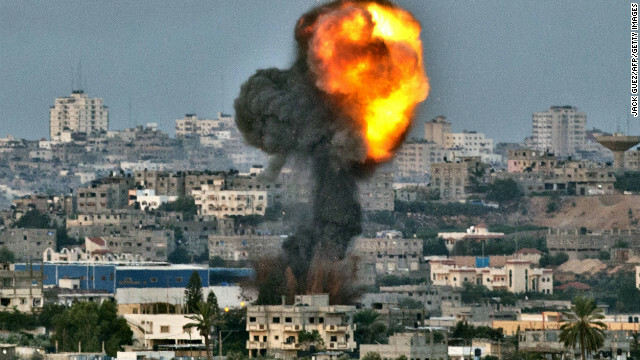 The Israeli airstrike targeted Yehya Bayaa, "a senior Hamas member," said Lt. Col. Avital Leibovich, the Israel Defense Forces' chief spokeswoman. The IDF alleges Bayaa is one of the leaders of a Hamas rocket-launching unit. The building hit was a known hiding place for Bayaa -- though not his home, as was reported earlier -- Leibovich said. 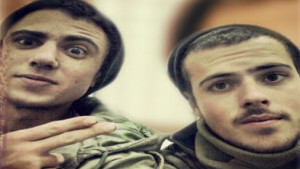 Initially, the IDF reported it killed Bayaa in the attack. But late Sunday, Leibovich said she did not know for sure whether Bayaa had been killed. Israeli military Capt. Eytan Muchman added Monday that, "very regrettably," the Dallo family was inside the building. 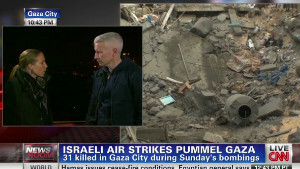 Regev later told CNN's Anderson Cooper, "Obviously, it was a foul-up" -- saying that while Israel doesn't know exactly what happened and believes Hamas is using civilians as human shields, it is "a failure" every time an innocent bystander is killed. That same day, hundreds gathered at the al-Isra mosque for a funeral of some family members killed, CNN's Ben Wedeman reported. The firing of rockets before and after the funeral didn't deter some mourners. 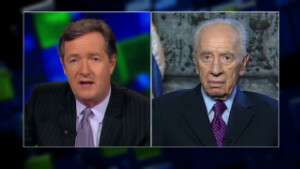 Talking Monday night with CNN's Piers Morgan, Peres insisted Israel has nothing against people in Gaza or Muslims, in general. He said his country's aim -- and the only reason it launched its military offensive -- is to keep its own citizens safe. "We don't hate them. We don't try to get any glories," the Israeli president said. "We want to live in peace." CNN's Sara Sidner, Arwa Damon, Jonathan Wald, Greg Botelho, Chelsea Carter, Kareem Khadder, Ben Wedeman, Fred Pleitgen, Amir Ahmed, Jessica Yellin and Mohamed Fadel Fahmy contributed to this report. Are you in the region? Share photos and video of what you are witnessing, but please do not expose yourself or others to a dangerous situation. Follow CNNArabic for the latest news and analysis from the Middle East and rest of the world. After Israel-Gaza: Who won, who lost? As the dust settles over Gaza and Israel amid relative calm, analysts consider who were the winners and losers from the conflict. Palestinian Authority leaders renewed calls for unity with their Hamas-led rivals after the latest Israel-Gaza conflict, but the fighting may have left Hamas with the upper hand. The relentless pace of the Israeli airstrike on Gaza gave the country's military time to make a significant dent in the offensive capability of Hamas, the Israeli military said. 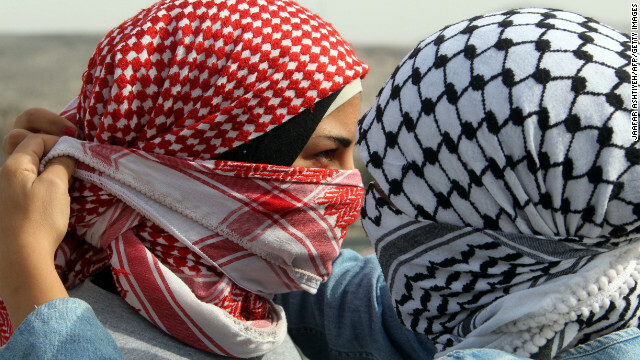 Can cease-fire result in real change? The brief but bloody Gaza conflict marks a clear wake-up call to both sides on the need to start serious talks beyond the new cease-fire. However crude the calculation, the winners and losers in the Israel-Gaza conflict are already reshaping political alliances in the Middle East. In the background of the drama playing out in Gaza and southern Israel, an election looms. On January 22, Israelis will go to the polls. Four-year-old Yosef lies in a hospital bed with curiosity gleaming in his eyes as he listens to a family friend tell him the age-old story of Jonah and the whale. Egyptian President Mohamed Morsy has won praise for his effort to bring about a cease-fire highlight the delicate balancing act he faces. Israel and the Palestinian militant group Hamas have been engaged in a bitter, decades-long conflict over Gaza. What is the group, where did it come from and what does it hope to achieve by its rocket attacks on Israeli targets? CNN explains.